Well, it’s day 4 of what was supposed to be a 1-day trip from my last duty station in Yongsan, South Korea to my home in Missouri where I was going to take 5 weeks leave before going to an Army school at Fort Belvoir, VA for 3.5 months. The mechanical problems on the plane that forced it to turn around over the Pacific Ocean and return to Yokota Air Base in Japan has shortened my leave by 3 days so far. Three days aren’t a lot normally, but when you have been separated from your family for a year, it seems like an eternity! It’s a sunny Sunday morning here in Japan and I am enjoying a cup of coffee with the rest of a cookie I got with my dinner last night. I’m hoping and praying that the new scheduled departure time for today happens without a hitch, so that I can be with my wife by the end of the day (or early Monday). This has certainly been an adventure with one disappointment after another multiplying the frustrations of the passengers who just want to get home. The airline I’m on is contracted by the U.S. government for these types of flights. It’s the same airline that I flew on going into Iraq during OIF. It’s not a big “brand name” airline but evidently the one who had the lowest bid so won the contract. They have put us in hotels every night and tried to provide meals, though many of the meals have been sub-standard. The Air Force personnel at Yokota Air Base have been amazing. They are stuck in the middle of this situtation between the airlines (who they have no control over) and the passengers who they are trying to take care of. Their attitudes and helpfulness have remained high over the last few days as they have had to put in long hours and even work on days that they’re normally off, just to take care of us. Usually the government takes care of all of our connecting flights to get us where we’re going. 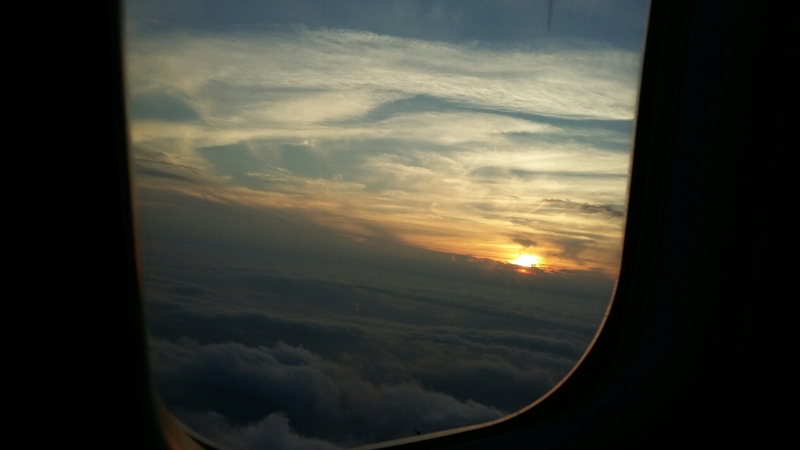 Since I am going “TDY en-route” to my training location and taking leave in between, I had to take care of my own connecting flight home. I booked through Delta Airlines using my frequent flyer miles (“Skymiles”) that I’ve accumulated on the couple of flights I made back to the States while in Korea for Army training. 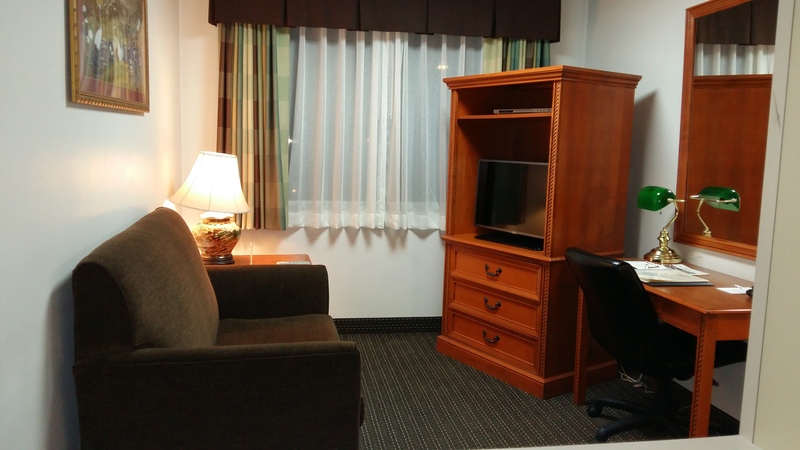 Normally, changes to these reservations come with a hefty fee, but they have changed my reservation three times without a charge, working with me (and my wife who has had to call the last two times) to make my experience as stress-free as possible. Delta Airlines has won a loyal customer through all of this! 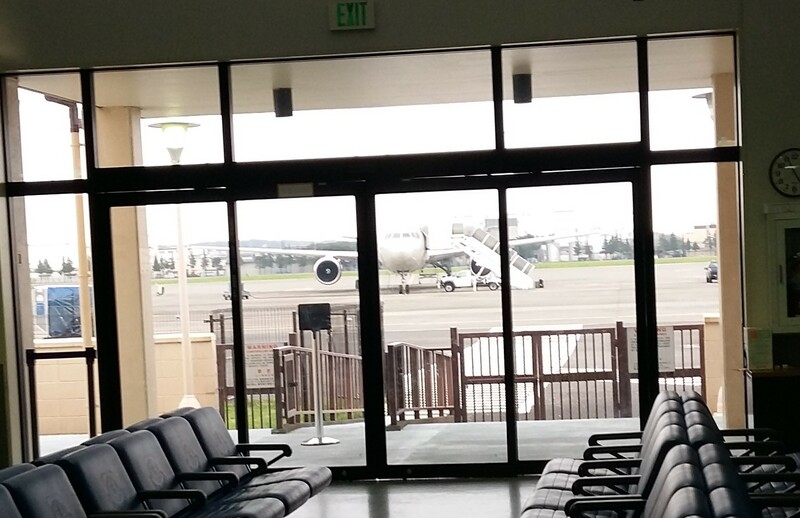 As of early this morning, the Yokota Passenger Terminal is telling us that the plane was fixed late last night and is scheduled to depart early this evening getting us into Seattle Sunday morning. Of course, we’ve been given similar reports every day of this episode, so the news is received with some skeptisim. Only when I’m buckled in and in the air will I believe that we’re finally leaving. We got back to the terminal about 1130 and checked our bags. I was looking forward to getting something to eat sonce I hadn’t had anything to but thr rest of my cookie from last night. However, there wasn’t an airline rep there to give us meal vouchers. I thought about having a pizza delivered so looked up the number fot the on-post Pizza Hut and called them only to be told that they didn’t bigin delivery until 1545. Oh well. About then, I heard the announcement that they were issuing the meal vouchers so I got one and got a Bacon Cheeseburger and fries. I am so tired of cheap fast food and ready for a home-cooked meal! The latest word is that we’ll be called to the secure area at 1330 but as I’m writing this I see it’s almost 1400. They also said that we’d begin boarding at about 1600 for a 1640 departure. We’ll see. The crew boarding the plane seemed like a good sign. At about 1500 we begin moving to the secure area. While we’ve been there before, it’s a good sign. RUMINT says departure time is about 1630. Again, we’ll see. At about 1730 they announced that we would soon start boarding. This was as close as we had gotten to leaving in three days. You could tell people were getting excited by the cheers that were raised with each progressive announcement. At the same time you could sense -and sometimes hear- the skepticism. We had been told before that we would be leaving. It was hard to believe that this time we would. Within a few minutes we did start boarding and there was a reserved optimism that we were finally on our way. The Air Force personnel had to do another roll call once we were on the plane, delaying our departure a little longer. Evidently the passenger manifest didn’t match the number of passengers. Once that was sorted out we were cleared to go. 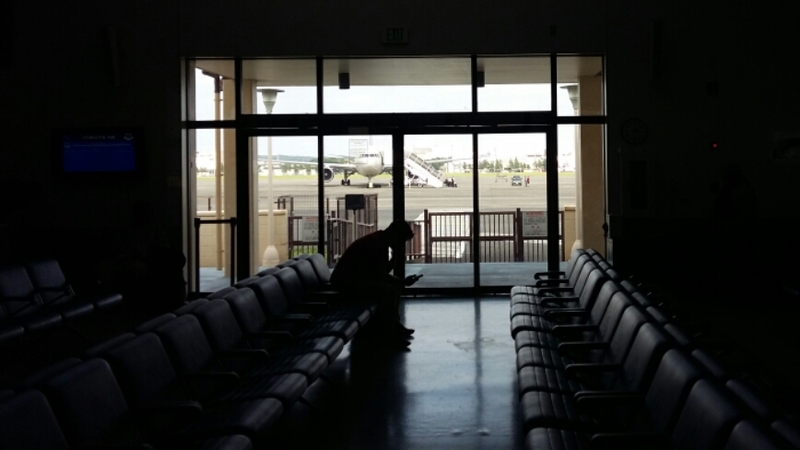 With every foot the plane rolled away from the gate the greater the expectation that it was for real. 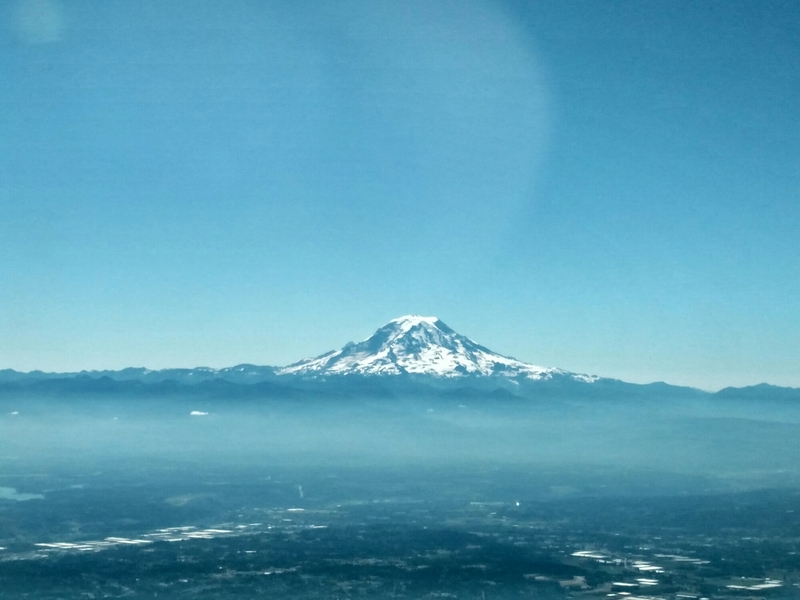 Every delay we encountered; every minute we were still on the ground, there was a chance that we would have to turn back, deplane, and resume the endless wait to go home. 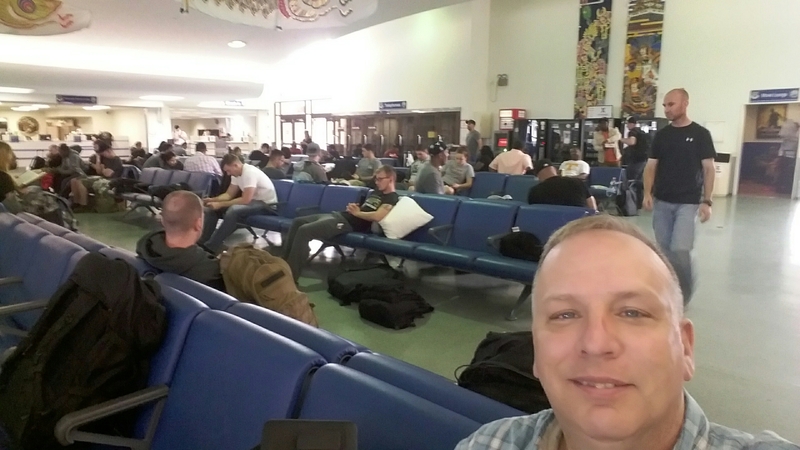 After a year in South Korea, I left Seoul for Osan on Wednesday morning then caught my flight from Osan on Thursday morning expecting to be with my honey Thursday evening. 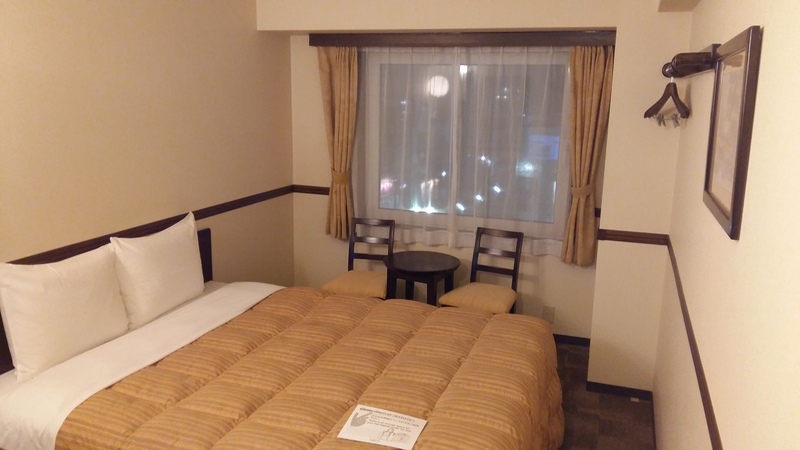 Instead, I spent the next three nights in Japan and most of four days in the Passenger Terminal at Yokota Air Base, while aching to be home. Finally at at about 1145, after four long days of traveling and waiting, I returned to American soil, soon to be back in my home with my family and likely not ready to begin another deployment for some time. 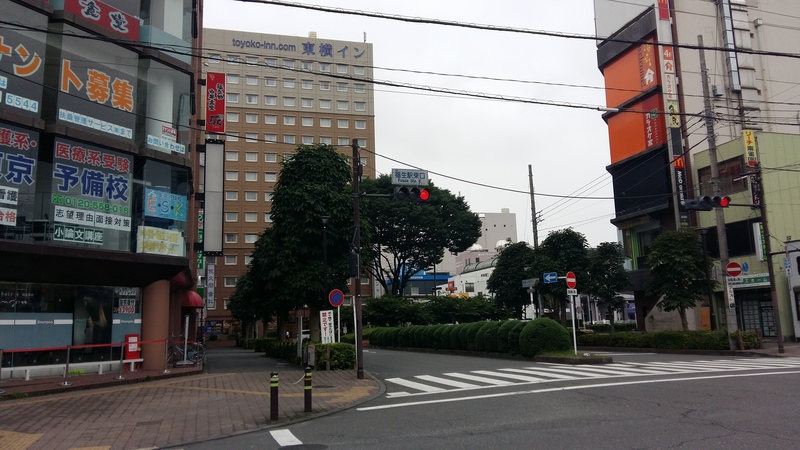 This is my 3rd day in Japan. I was just supposed to be here for a 2-hour layover! You can read about my 1st day in Part I and my 2nd day in Part II. 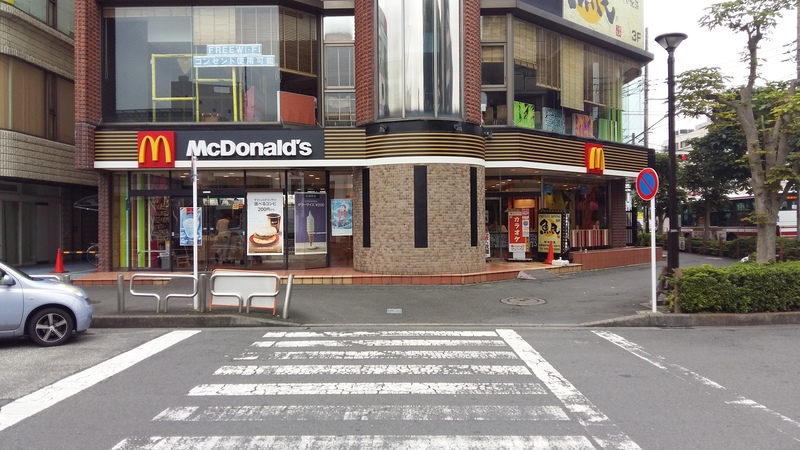 As for my 3rd day, I had noticed last night that there was a McDonald’s across the street from the hotel so I decided that I would add Japan to the list of places that I have eaten at McDonald’s (and, I like their breakfast). So I walked by the hotel-provided breakfast to the door and crossed the street. I went in fully expecting them to accept plastic (doesn’t everybody?) but was surprised to learn that they only accepted cash! 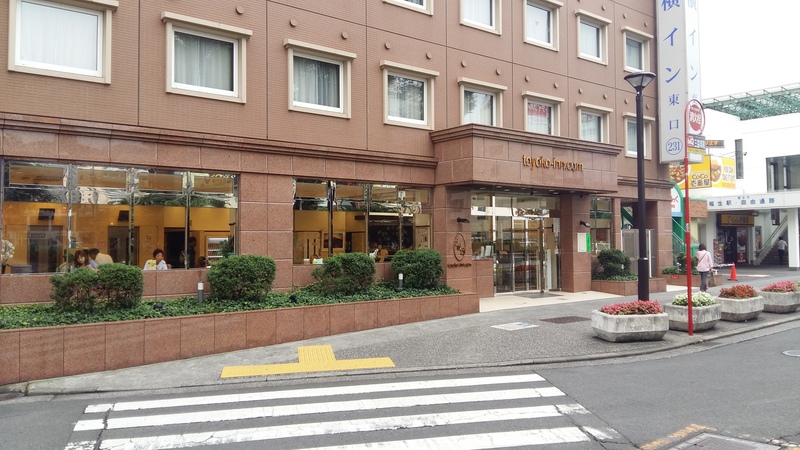 Disappointed but not defeated, I went back to the hotel front desk to exchange some U.S. cash for Yen, since I had done that at the hotel I stayed at the night before. To my dismay, they did not exchange currency and directed me to a bank, which there wasn’t one nearby and I doubt it would be open on a Saturday anyway. I asked about an ATM and in their broken English said, “7-11.” Of course. I wasn’t encouraged by that since the last time I was at 7-11 I would have had to withdraw 10,000 Yen which is roughly $100. I wasn’t that hungry! I went anyway thinking maybe this ATM would be different than the last but it wasn’t. I give up (on McDonald’s, not life or anything like that!). The front of the hotel. 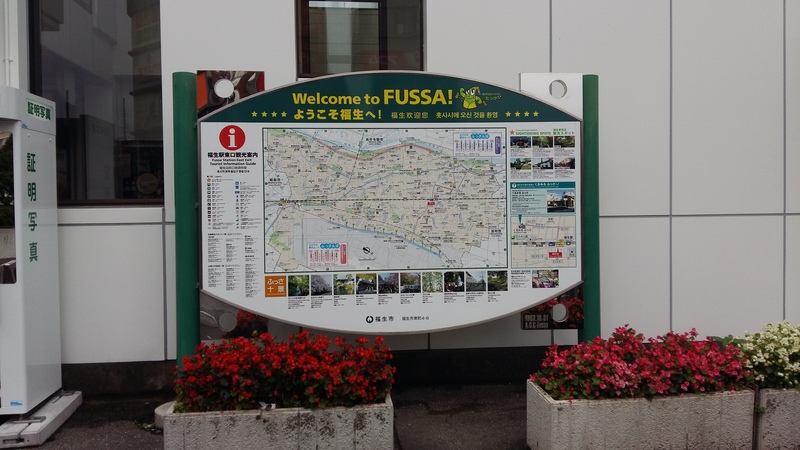 The town near Yokota Air Base where the hotel is located is called Fussa. 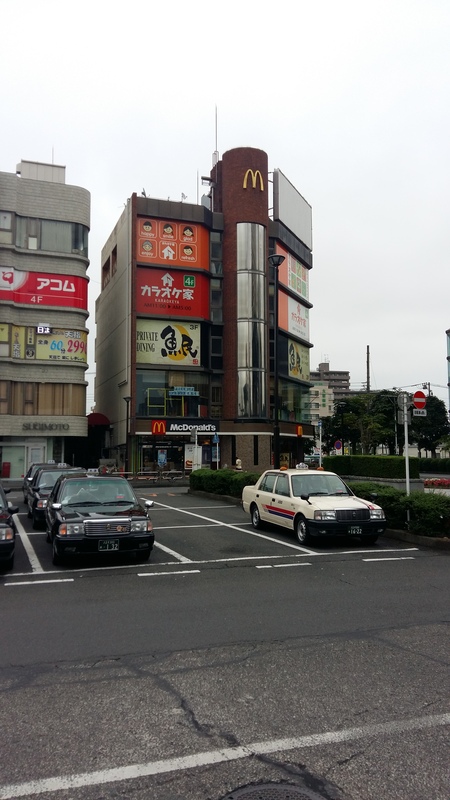 The large building where McD’s is on the 1st floor (where I didn’t get to eat!). 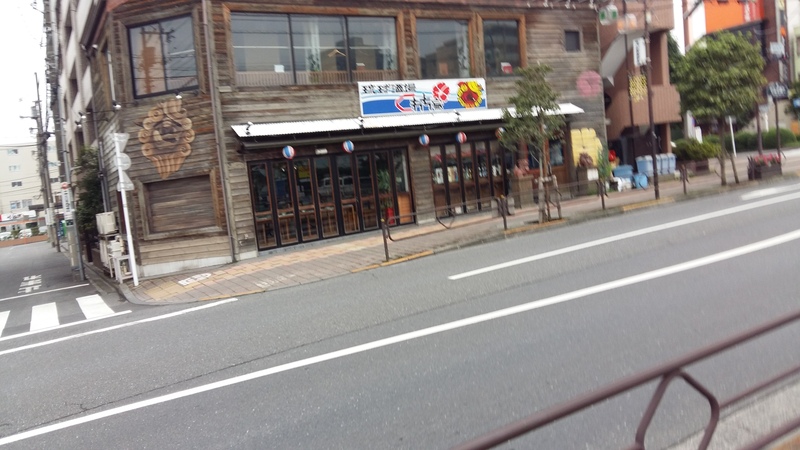 A restaurant near the hotel (across the street from 7-11). It’s an interesting mix of Western and Eastern styles. Another view near the hotel. 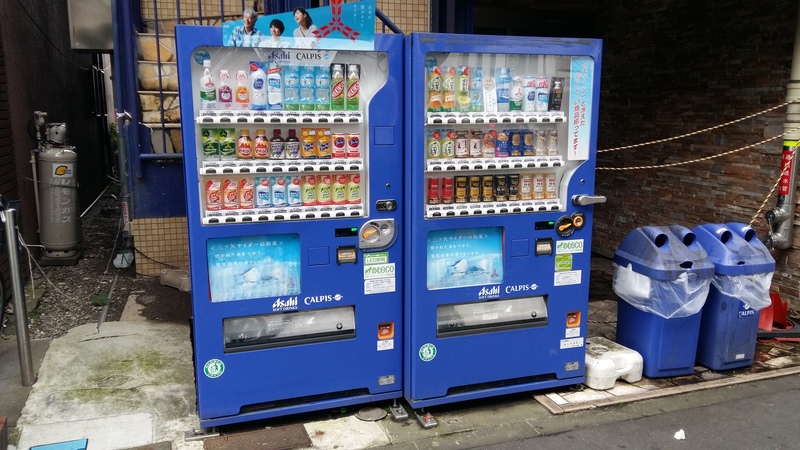 There are vending machines everywhere! 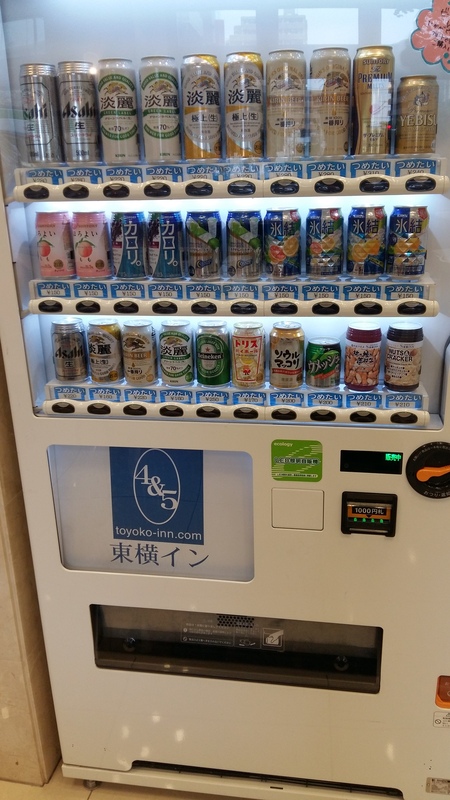 You can even buy beer from vending machines, though you need a Japanese id to verify your age. 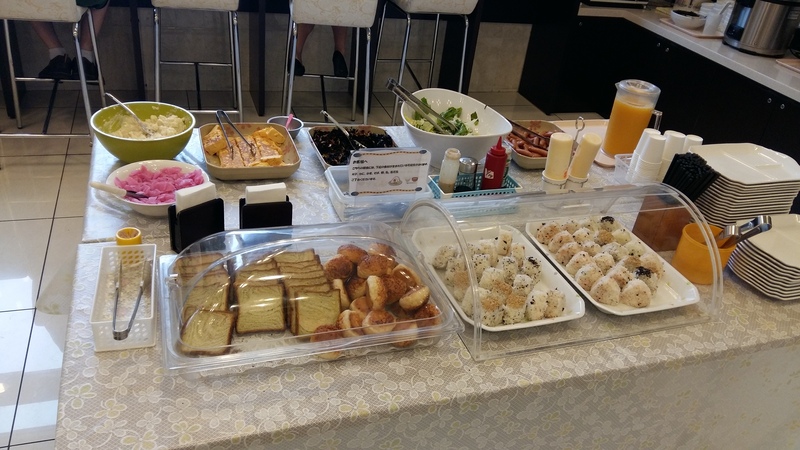 The breakfast offered by the hotel. I’m sorry, and no offense intended toward the Japanese people, but nothing here appealed to me. I got coffee. Black. 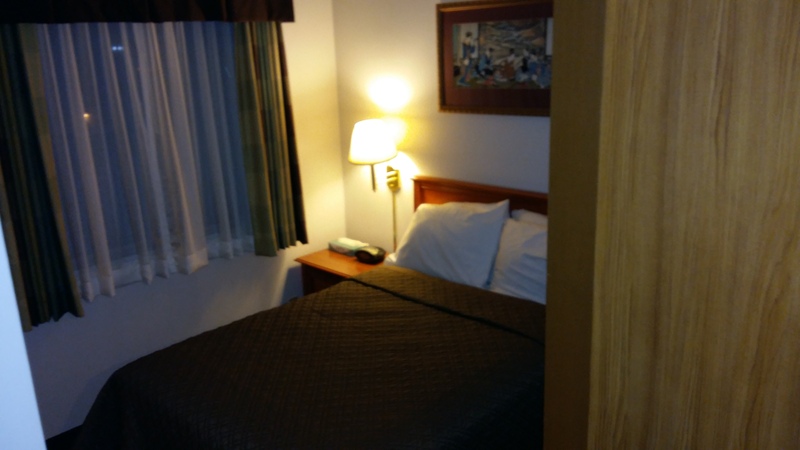 The buses were scheduled to pick us up from the hotel at 1000 so another day in the room wouldn’t be charged. That got us to the Passenger Terminal before 1100 where we waited in line nearly an hour to re-check our bags. Yesterday they announced that our show time was 1800 but after a little while in the Passenger Terminal , they announced it would be 2100 then about 5 minutes later changed it tp 2000. I wonder how many more times it will change! It turned out that they were able to get the parts they needed from Korea so it looks like they’re still trying to fix it instead of sending another plane. I hope they can fix it, otherwise we’ll be waiting even longer for that replacement aircraft. I used my voucher and got lunch at the eatery in the Passenger Terminal. Since I didn’t have breakfast I was really hungry so the Classic Bacon Cheeseburger and fries tasted good. After lunch, more waiting. I’m debating about walking up to the BX Mall but that will mean lugging my backpack in the heat…I went ahead and walked to the BX (Base Exchange instead of Post Exchange like on an Army Post) to get dinner and cough drops; and just to do something. There really wasn’t time or means to go very far. The flight schedule could change at any time. I got a Philly Cheesesteak from Charlies (Charly’s?) Which was really good. 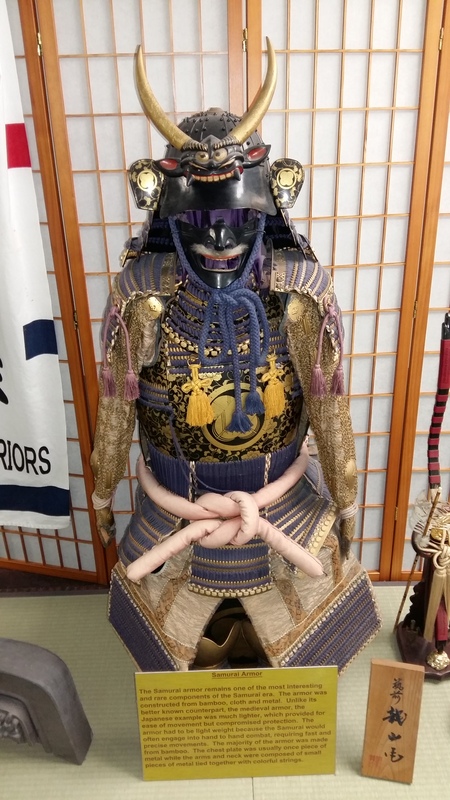 I also looked around a bit and saw a Samurai sword that my daughter asked me to get her when she heard I was in Japan. 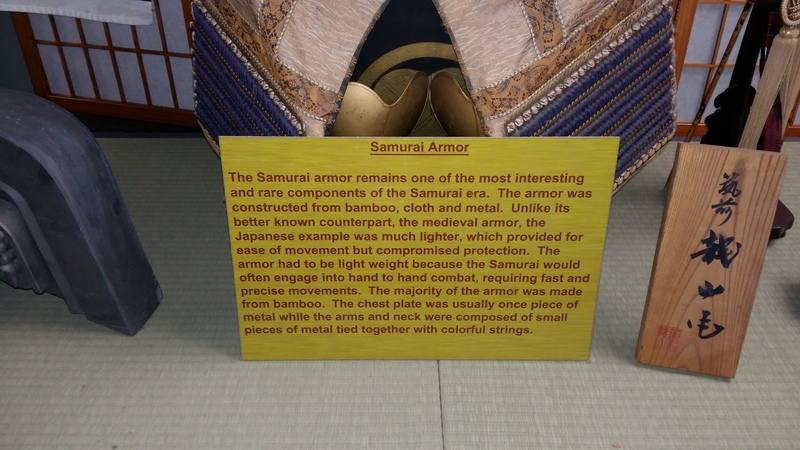 Unfortunately, you carry a sword on a plane and it was too late to get it into my checked baggage. I guess I’ll need to come back! While I was out I walked by the Traditional Chapel to get better pictures. Sadly, it was locked so I couldn’t get any of the sanctuary. 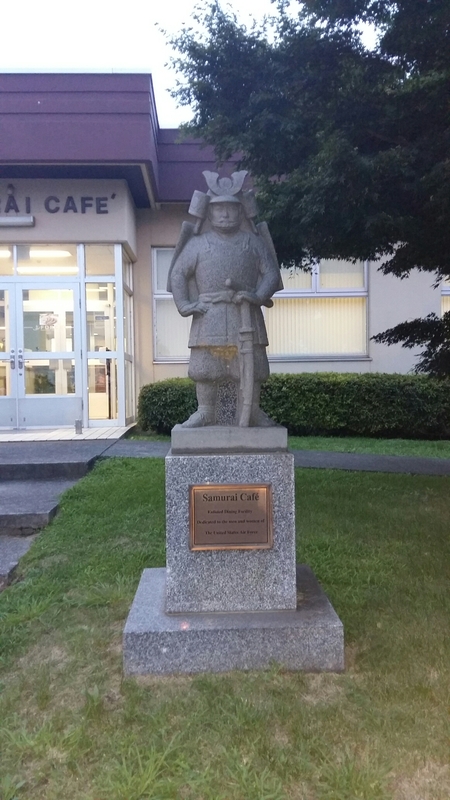 There were a couple of small Samurai statues in front of a cafe which were kind of neat. 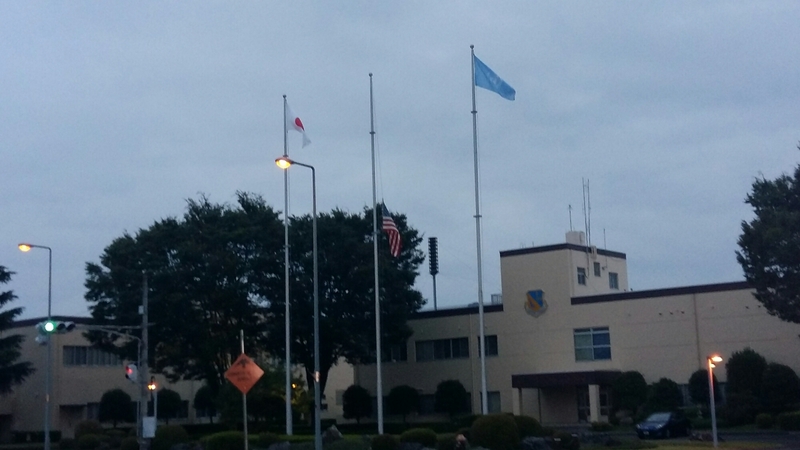 They were across the street from one of the wing headquarters where there were the flags of the U.S. (still at half mast), Japan, and the U.N.
Back at the Passenger Terminal a bit more tired after the walk with a heavy backpack. Back to the waiting (which is the hardest part!). At 2000, the time we were to show up at the Passenger Terminal for our flight to leave about three hours later, the airline representative announced that the plane still isn’t ready to go so they’re putting us back in hotels to show up again tomorrow (Sunday) at noon. Here we go again! You can feel the frustration in the room. Even some anger. One Soldier missed his wedding. Another missed her son’s birthday. I really miss my family and want to get home to them! Who knows how many other life events have been missed or are about to be. It’s really nobody’s fault. Things break down. Delays happen. But this is tough on our Service Members. This is hard on their families. This is bad. The last announcement they made is that they’re going to double up on the hotel rooms. I don’t think so. That is not SOP. That will not work. 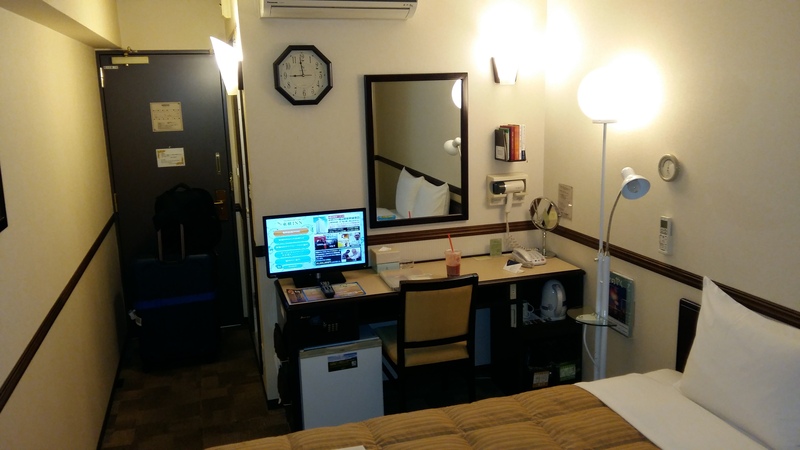 They also are putting people in rooms in downtown Tokyo which is about 2 hours away. That means by the time they get there and have to get back, they won’t get much sleep! A few rooms opened up at a lodge on post which I jumped on. It’s an old building but nice. There’s actually a bedroom, living room and kitchen (and bathroom, of course). 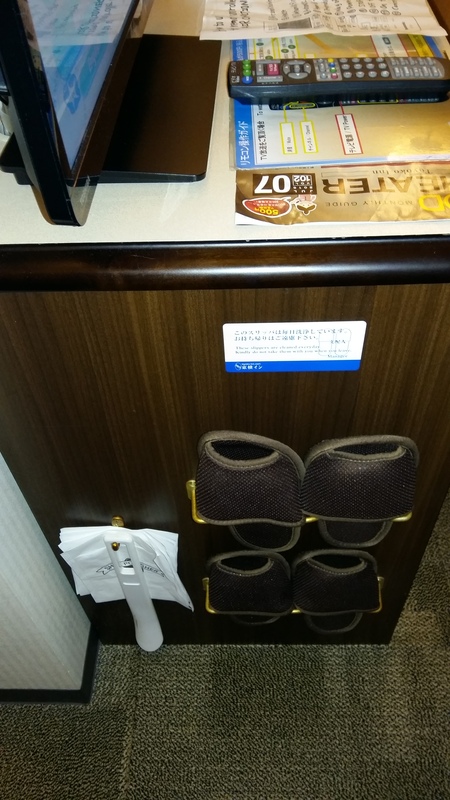 Military lodging also has free laundry rooms so I am able to get clothes cleaned. I sent most of my civilian clothes home with my un-accompanied baggage and mailed boxes, since I didn’t anticipate this trip taking so long. It will be nice to have clean clothes! There’s another chaplain on this flight with me, a Catholic Priest. I talked to him this evening about he and I offering services at the Passenger Terminal tomorrow. I think that sharing this common experience has created a sort of “bond” similar to deployments so I believe that worship together could be meaningful. Having a Protestant and a Catholic chaplain, we can have two services to cover most of the bases. Well, it’s late and this day is about complete. It’s been another long day with no progress on getting home. Hopefully tomorrow will be better and I’ll be on my way. 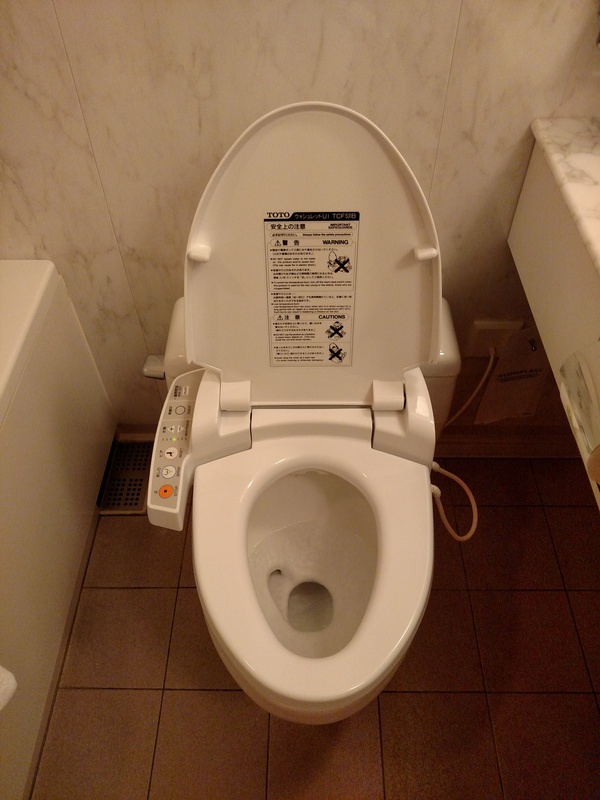 Day two in Japan. (You can read about my 1st day in Part I). After a decent night at a very nice hotel I was shuttled back to the AMC Passenger Terminal and the airline provided breakfast at the eatery in the terminal. Not very good on a normal day, but preparing food for all the passengers of a delayed airplane put “mass production” to the test. In a “carryout” styrofoam container I was given two pieces of toast (cold), a square scrambled egg (not very warm), a piece of sausage (not very warm) and tater tots (their version of hash browns). The taste was OK, but as mentioned, it wasn’t fresh or hot and just barely hit the spot. At least I wasn’t sitting and waiting on an empty stomach! 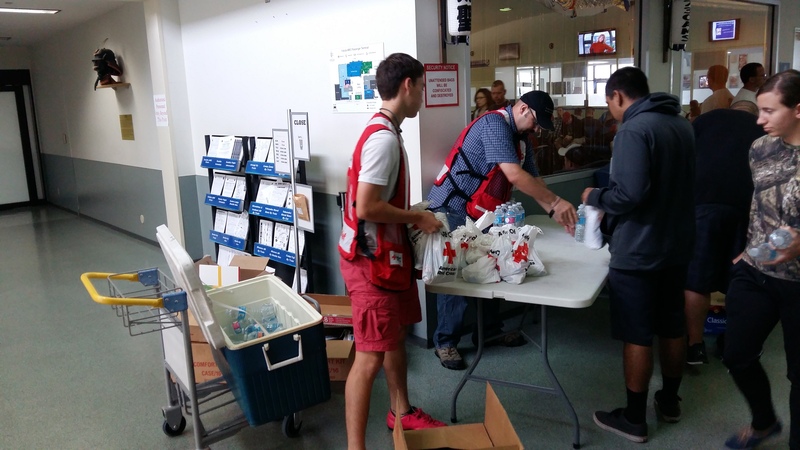 The Red Cross showed up with comfort items and snacks which was nice. Of course, it just confirmed the “disaster” we were experiencing! 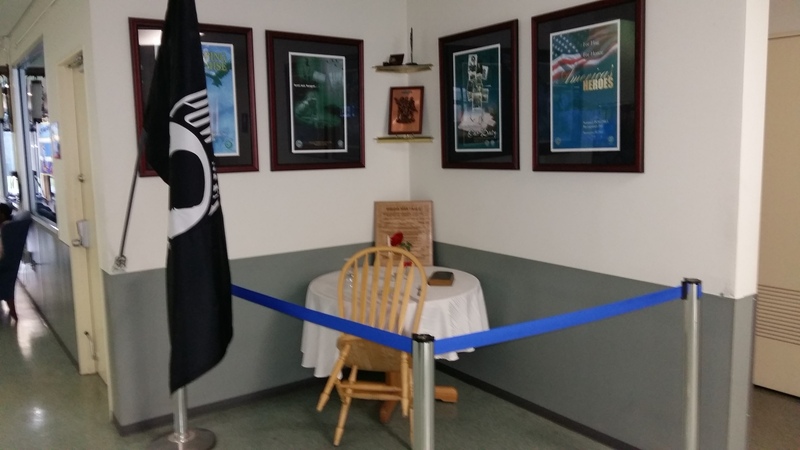 The “Missing Man” table in honor of those Service Members KIA and MIA. 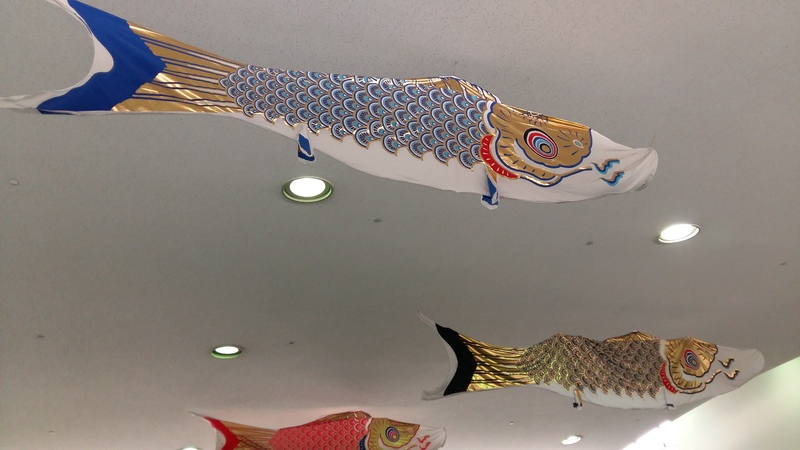 Japanese windsocks hanging from the ceiling of the terminal. After several hours in the main terminal with occasional announcements about our pending departure, they ran us through security into the “secure” waiting area where he had even less freedom or access to conveniences. 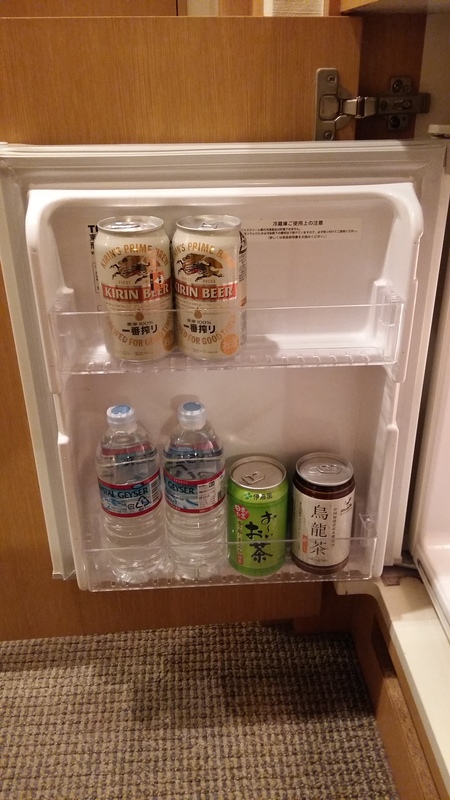 Since I was through security I was able to get a Japanese Coke can from the vending machine, to add to my collection but that’s the highlight of the day. Following two or three announcements of further delays with minimal explanation, the eatery from the passenger terminal bought “lunch” for the stuck passengers. Some got chicken sandwiches, some deli-style sandwiches, some chicken “nuggets” and all with french fries. I’m in the habit of being at the end of the line (I think it’s a chaplain/pastor thing, waiting until everyone else is fed to be sure there’s enough). By the time I was there my choice was chicken nuggets (which at least were fresh and hot) and cold french fries. Yum. About that time, the pilot of the plane made an appearance with an explanation about what had happened and what the plan was. 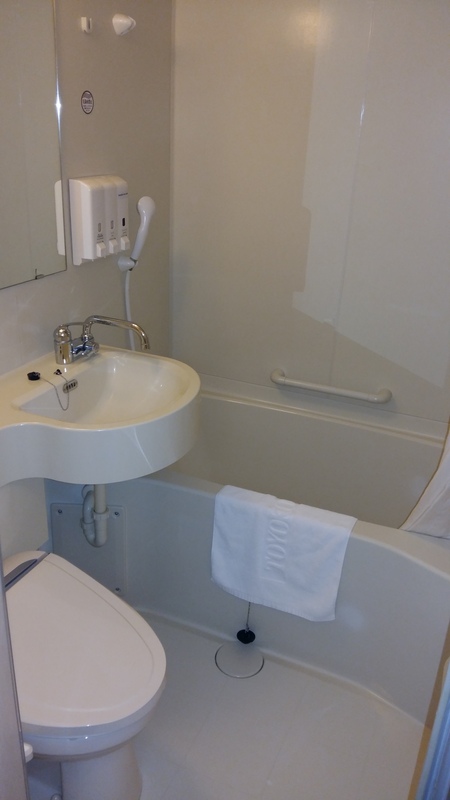 He admitted that the toilets could not be fixed here and had to be sent back (without passengers) to the U.S. for repair. There were psrts ordered from another airline they were expecting but that airline decided they needed them for one of their aircraft. He announced that they were trying to get another plane here to get us home but wasn’t sure how long that would take. When he was through, I took the opportunity to talk to him privately. I told him I understand the repair issues and the necessary wait but told him about the meals not being adequate and asked if he had any contact with his company. I told him again, I’m not complaining about the delay, it happens, but with the delay they need to take care of their customers. He did thank me and said he’d see what he could do and later said he talked to the lady on the ground who was in charge and thanked me again for letting him know. I wasn’t complaining for myself, I could just buy better food on my own (when not in the secure area) but a lot of those traveling were families and junior enlisted who would have more difficulty bearing the cost on their own. Not long after “lunch” they released us from the secure area to the main terminal and announced that they were off-loading our checked baggage for us to retrieve, and working on arrangements for the night. 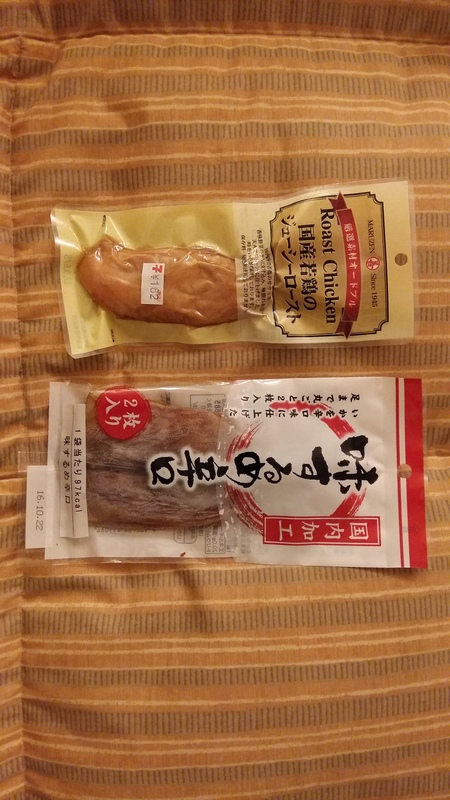 The airline gave us another meal voucher, though it was only good at AAFES (on post) dining facilities. As they were making the room assignments, they said we would get breakfast at the hotel and they would give us meal vouchers (again, for on post) the next day. I tried my wait-until-the-end-of-the-line plan again, hoping for the nice hotel but it didn’t work this time. 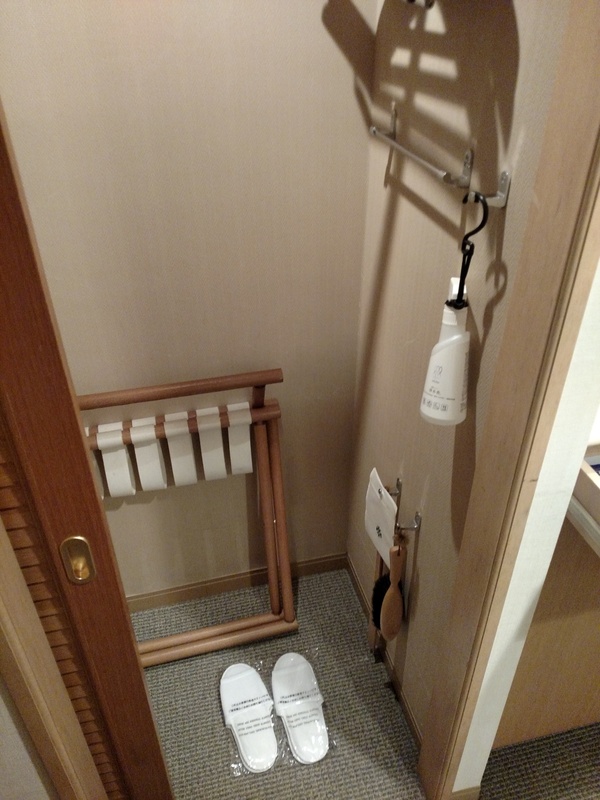 I guess they had enough rooms in the cheaper hotels they didn’t use the better ones. Not a bad hotel but after the last night it seemed tiny and lacking. 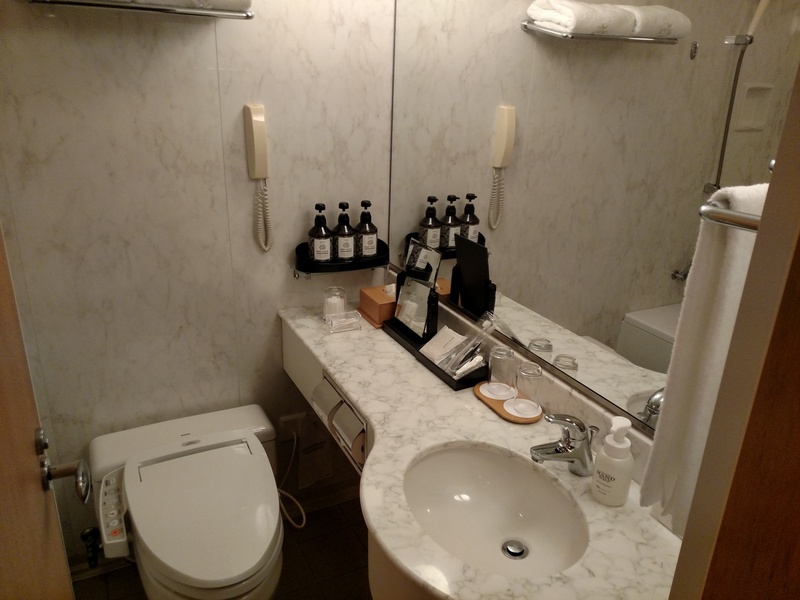 The whole bathroom was like a self-contained pod…and small. 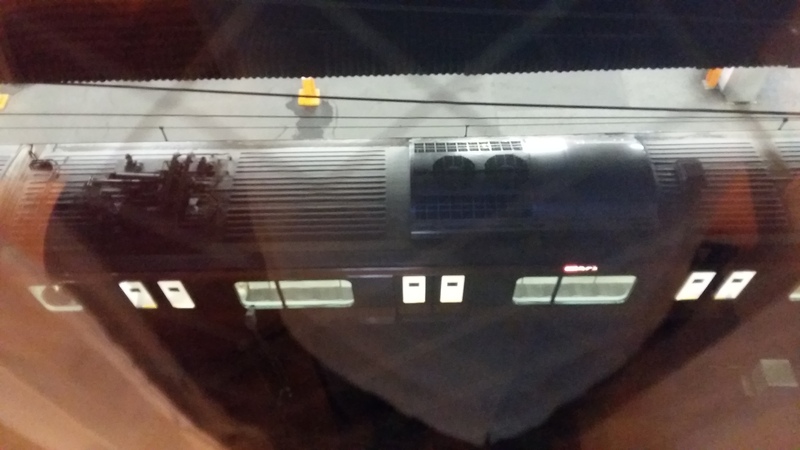 The train station was right below my window which concerned me but it turned out I could barely hear anything from it. 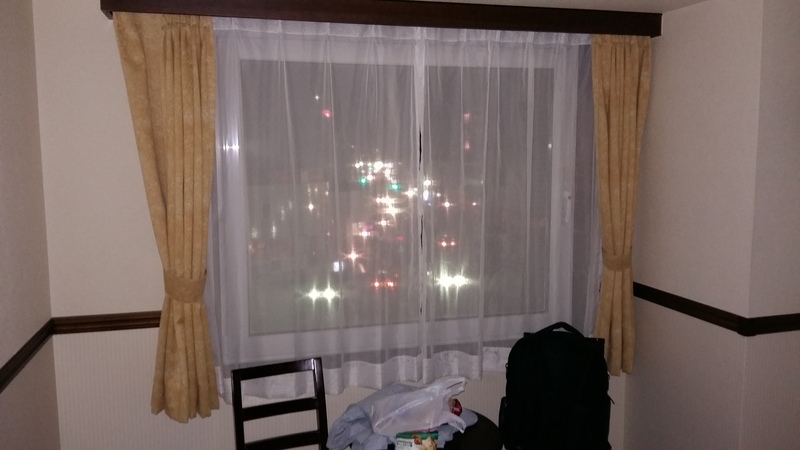 The lights from outside also concerned me but the blackout curtains did their job. I needed an adapter to plug in my laptop and wanted to see what there was to see anyway, so decided to go for a walk. 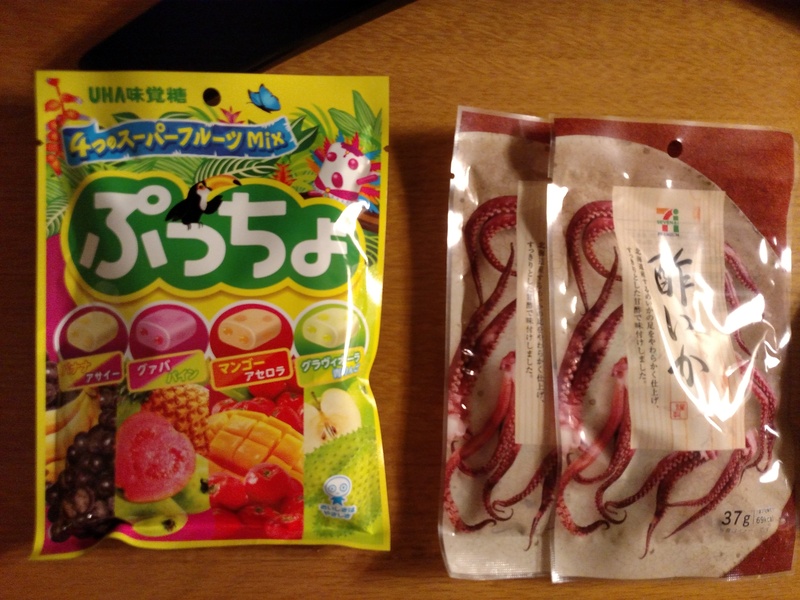 I found another 7-11, which wasn’t hard and got what I needed plus a couple other goodies. 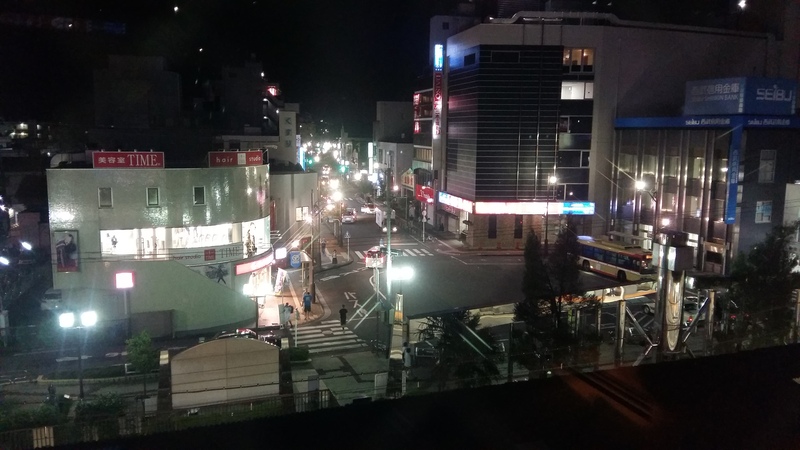 Night time pictures aren’t the easiest but I got a couple then went back to my room. 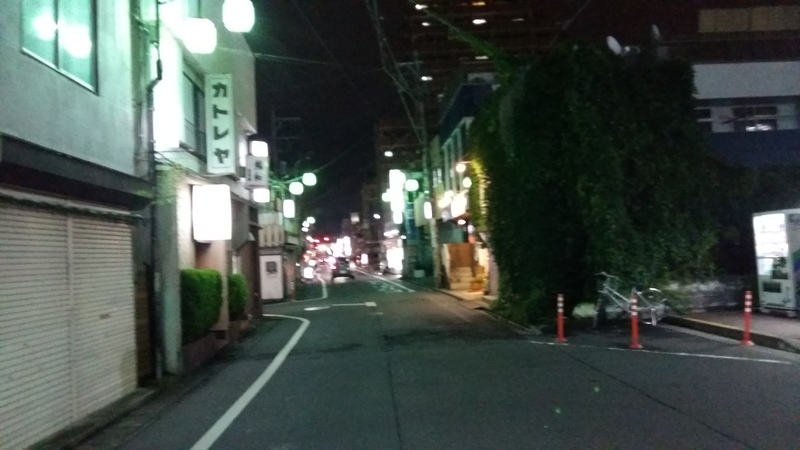 A shot down one of the streets at night. I set my alarm for 0700, which was like sleeping in, and began to prepare myself for another day of waiting or travel or both. The bed was hard and the pillows were weird but I finally got to sleep though didn’t sleep well on a new bed (again). I was up and ready to go for a walk in the light before heading back to the passenger terminal. 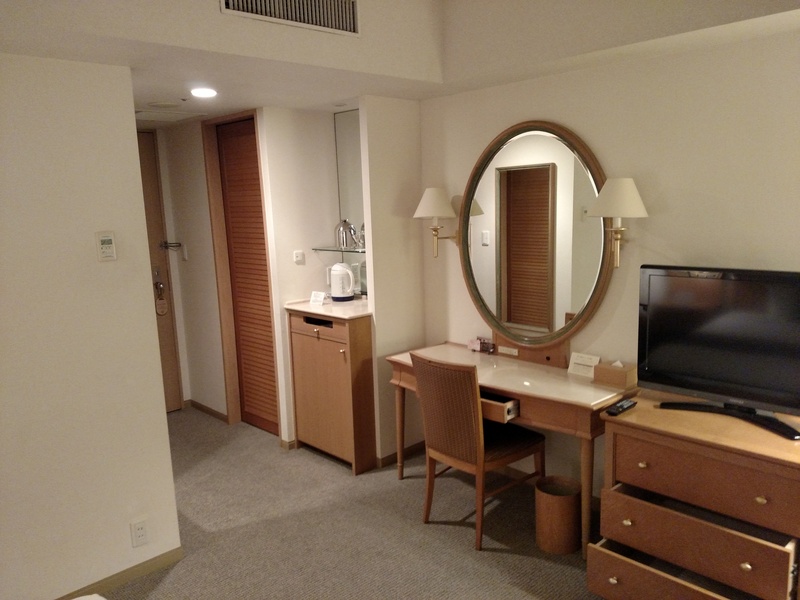 More on that and the events of my third day of a one day trip at To Japan and Back Again (Part III). 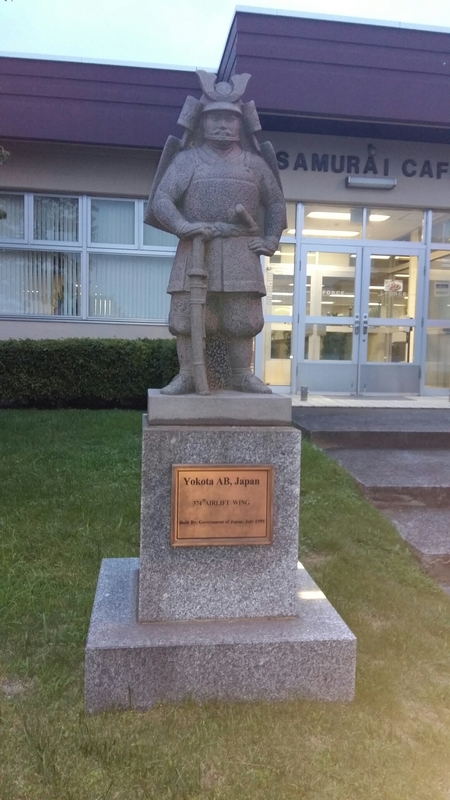 On its trip from Korea to the United States, the Patriot Express flights make a stop in Yokota, Japan for a short layover while those going to Yokota get off and those getting on are processed. They also add more fuel for the trip across the ocean. This is usually about a two hour layover. All was going fine: we layed over, re-boarded and got on our away. 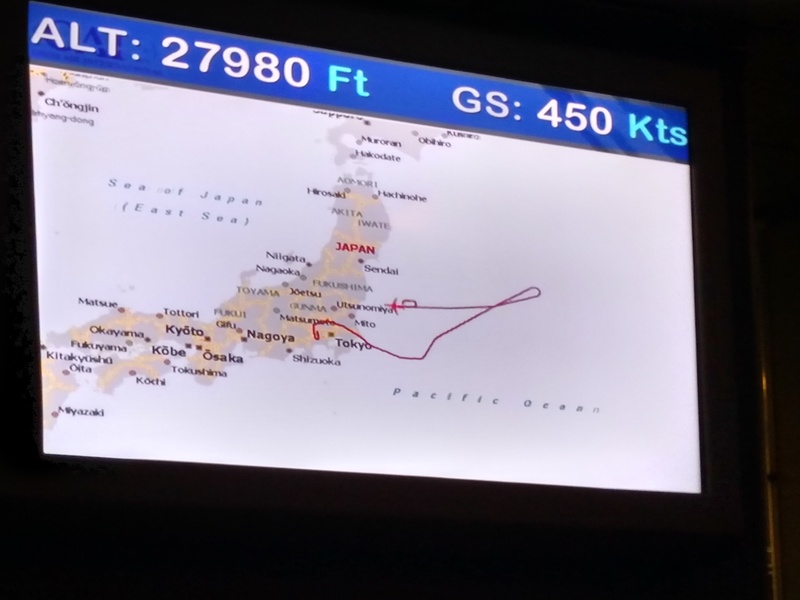 About an hour into our flight, however, (and keep in mind that we’re now over the ocean) the Captain comes on the intercom and announces that they are having mechanical problems and need to return to Yokota. He goes on to say that they’re not “safety” issues but “comfort” issues and explains that all but two of the planes 8 toilets have stopped functioning. With a plane full of people and many hours to go, that can be a problem! So, the captain said we’d be turning around and would hopefully get it fixed and get back on our way soon. You can see our flight path. Well on the way, then turning around to go back to Japan! Well, it wasn’t a quick fix. After waiting several hours, they brought out food for us (pizza and subs…) and began making hotel and transportation arrangements which took quite a while. It’s really a bummer when you are all set to get home and see your family who you haven’t seen in a long time, and the plane turns around and heads the other direction then a short delay turns into an overnight stay. 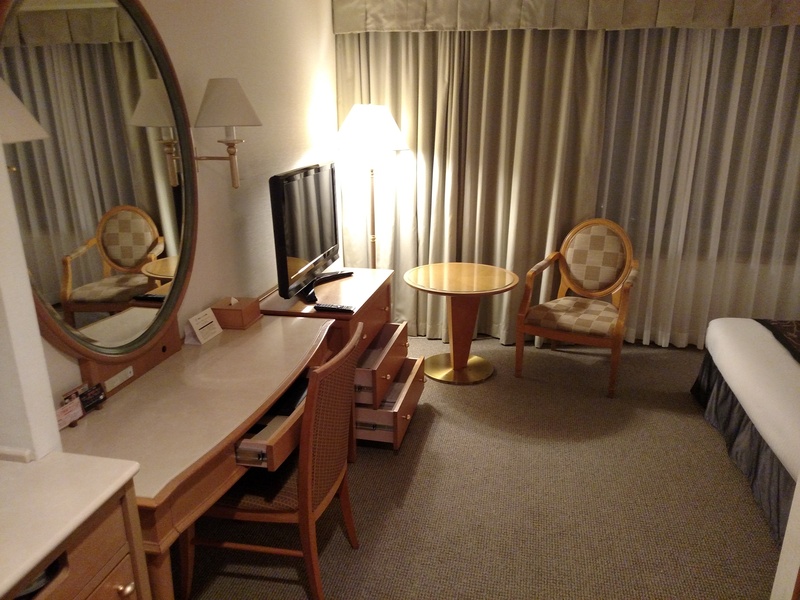 This is the way the room was presented. Drawers partially open (fancy) and very nice furniture. 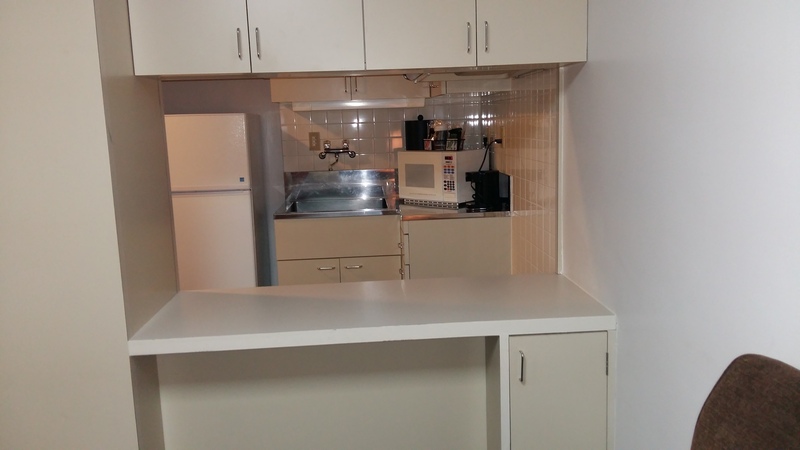 Inside that cabinet to the left of the desk is the refrigerator. Too nice of a room for it to be exposed! Big, comfy bed, of course! 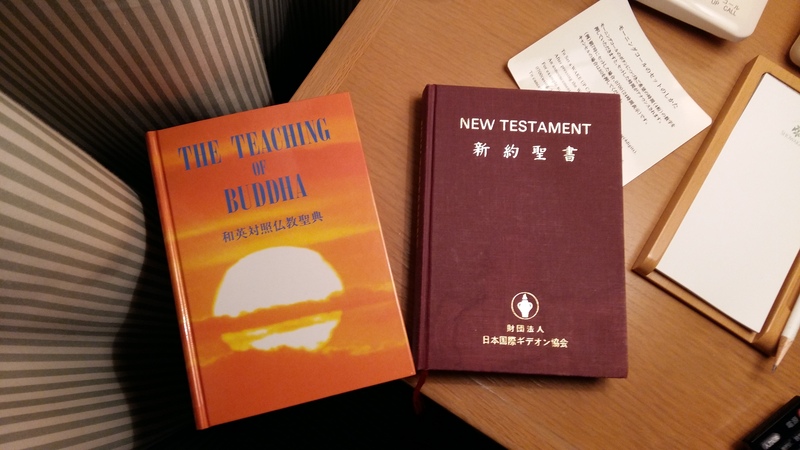 In the nightstand was not only a Gideon’s New Testament but also The Teaching of Buddha. 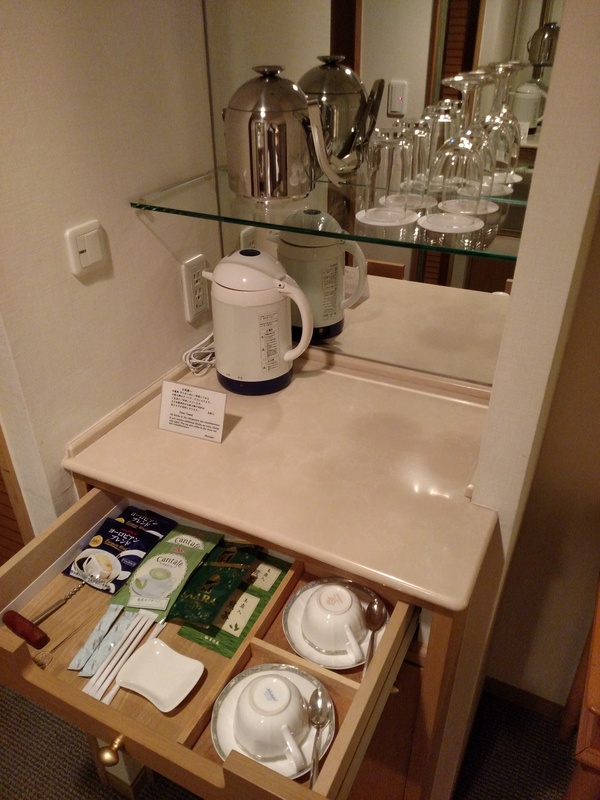 The drawer over the refrigerator has an assortment of teas and coffees (some that I brought home for Holly) and Noritake tea cups/saucers! 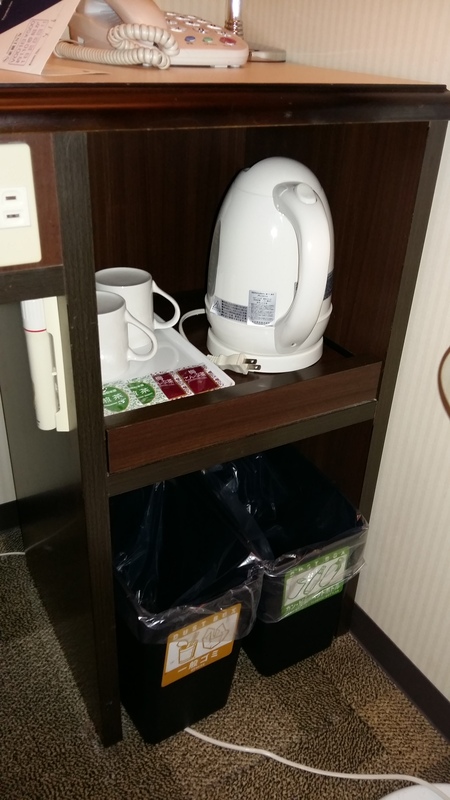 The mini-bar had complementary drinks but I went with water. 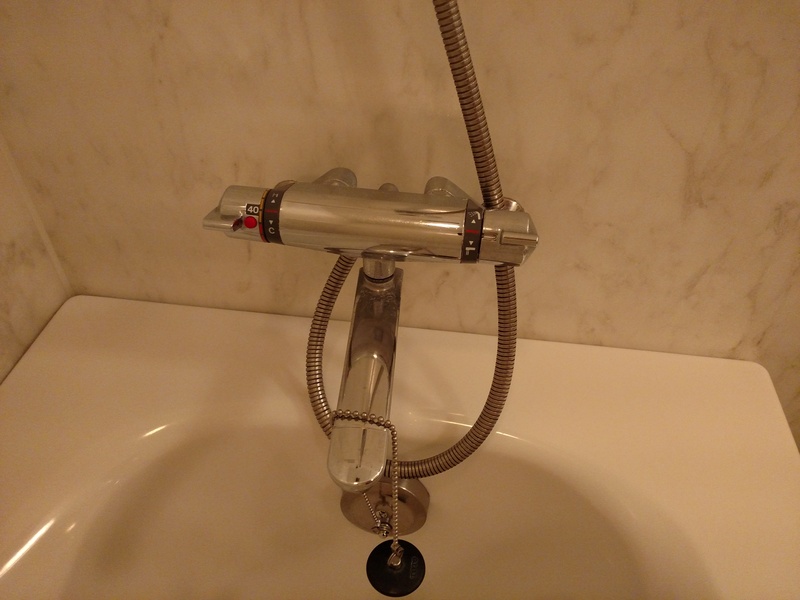 I didn’t use this! Well… I used it, I just did take advantage of all of the features. 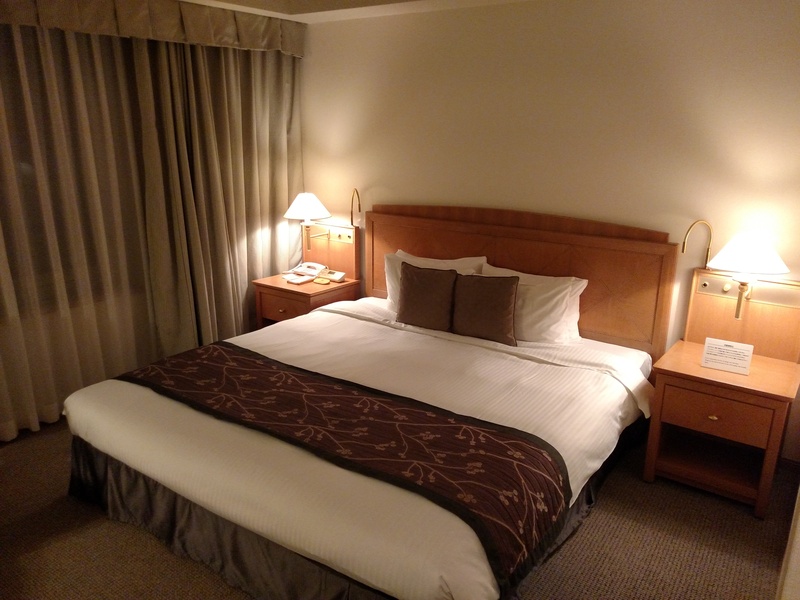 So as you can see, they put me up in a very nice hotel which allowed me to relax some after a hectic day. 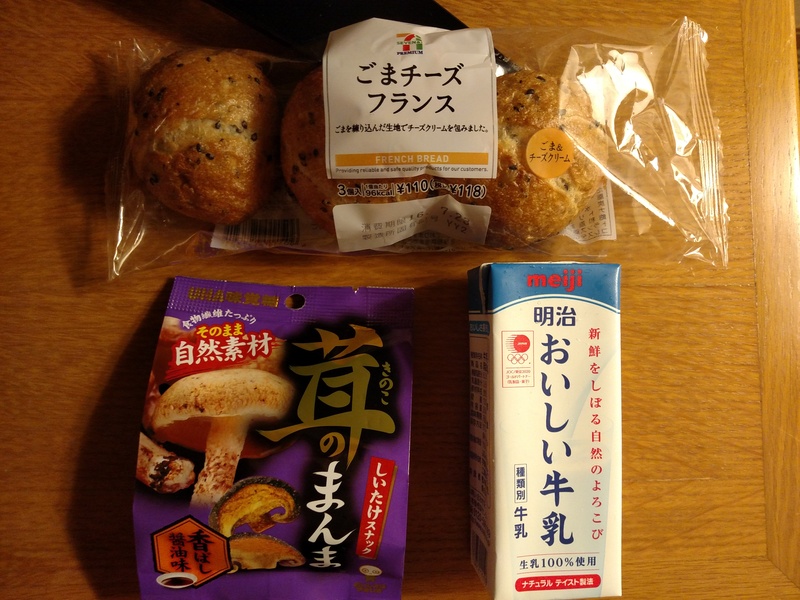 Before turning in, however, I went for a walk up to 7-11. 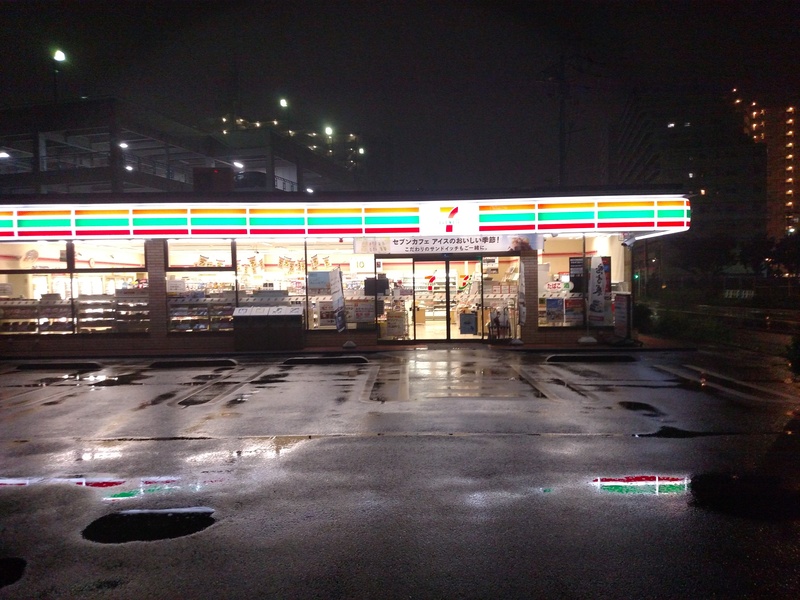 It’s not that 7-11 is all that spectacular (though I’ve heard the thousands of them in Japan are much better than the ones in the U.S.) but it was the only place nearby to get a snack. It was beginning to rain so the the hotel clerk let me use an umbrella. On my walk, I found it very funny to see so many people riding their bikes in the rain-holding an umbrella! I don’t think I’ve seen that anywhere else that I’ve been. 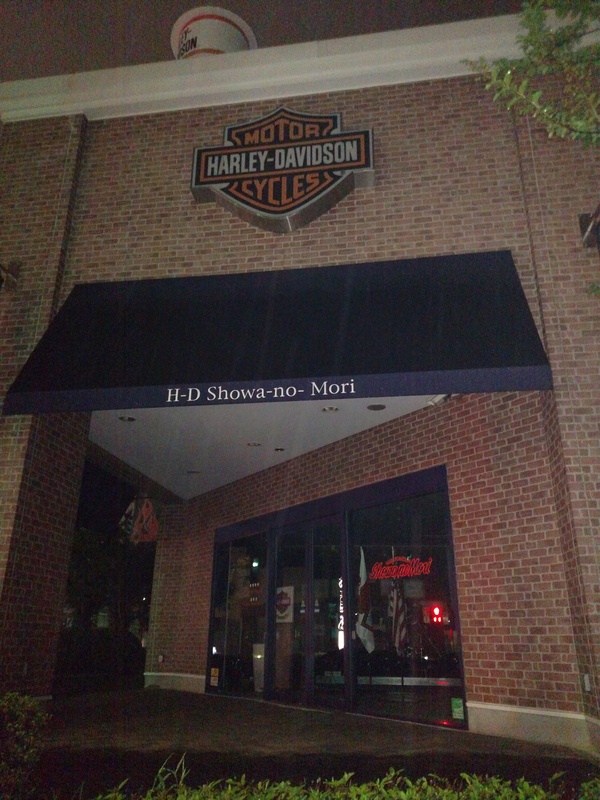 It seems like there’s a Harley-Davidson shop just about anywhere I go! 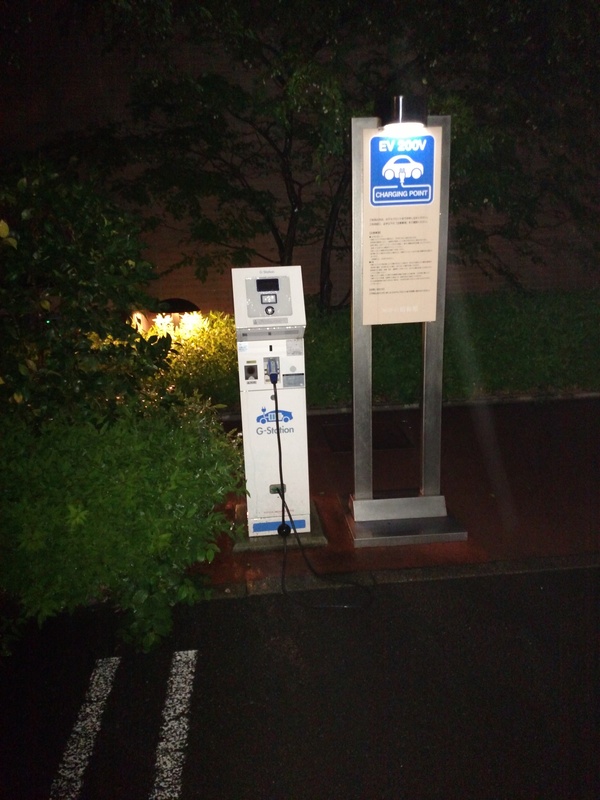 There were charging stations for electric cars in the hotel parking lot. After about a ten-minute walk, I got to the 7-11. The outside looks pretty much the same as any other. 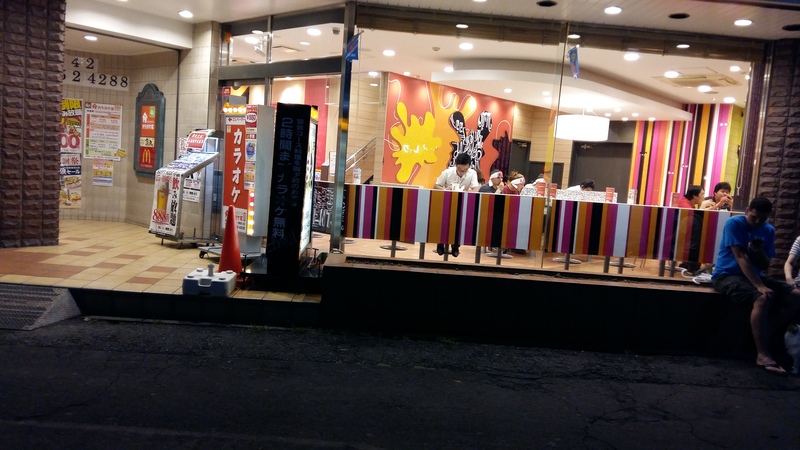 The inside, though, had things you won’t find in a U.S. 7-11! 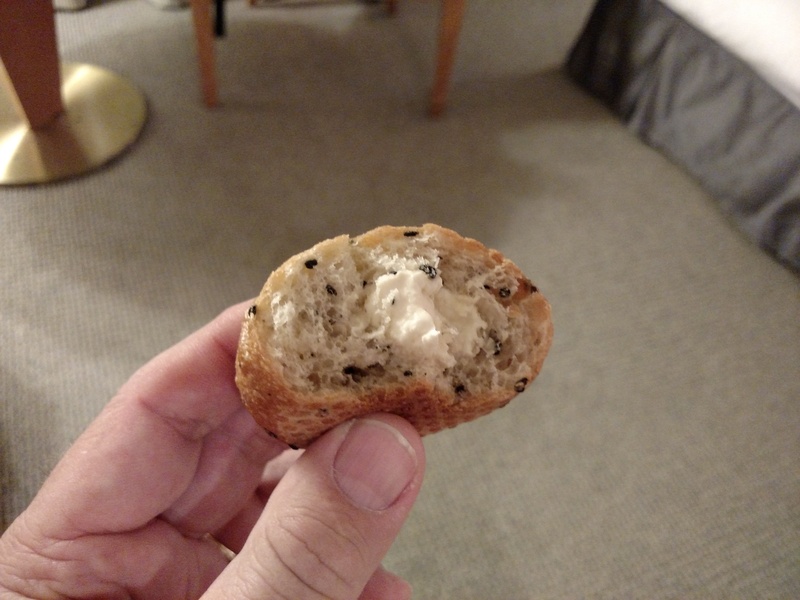 Those French Bread rolls were yummy, and came with butter inside! After my walk and roll, it was getting late so I tried to get some sleep. The bus was going to be there at 0600 to pick us up so I had to get up at 0500 to be ready. Not much of a full night’s sleep, but I got to relax a bit anyway. The next day began with a breakfast that was, how should I put it? Anything but optimal, but the events of the next day I’ll save for To Japan and Back Again (Part II)! This is my last night in Korea after being here 377 days. I came on orders reluctantly, not wanting to leave my family or the position I was in, but as everyone who wears the uniform understands, when Uncle Sam says “go,” we either go or we get out. 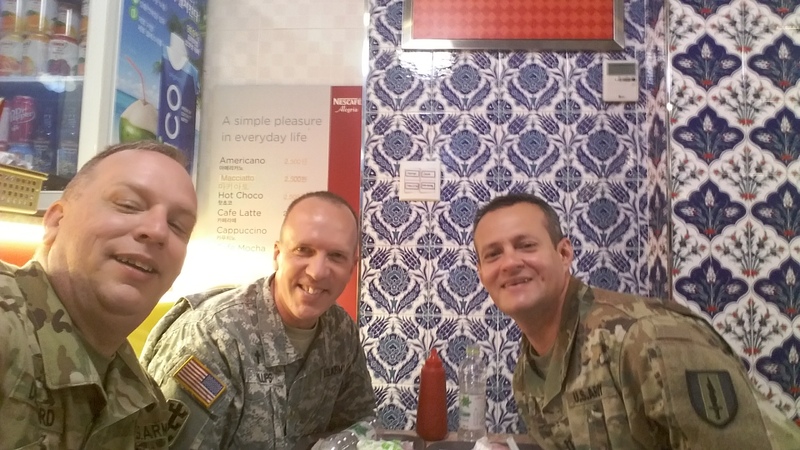 Since I believed that God still wanted me serving as a Chaplain in the Army, I “saluted the flag,” packed my bags, and said “goodbye” to my family. After arriving, however, I discovered that my new unit of assignment was a great one that I would enjoy being a part of while ministering to its Soldiers and encouraging and equipping the chaplains in the subordinate battalions. 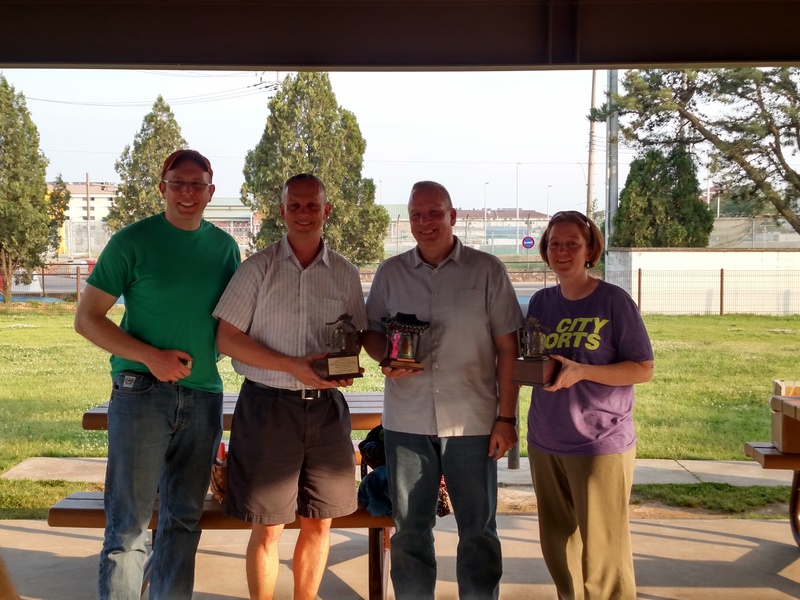 Those chaplains, Eric, Maya and Brian, proved to be great chaplains and grew to be good friends. I also appreciated the chaplain assistants and KATUSAs both in the battalions and my UMT in the BDE, SSG Pagan, SSG Kendrick and CPL Kim. Had this been all that this year included, it would have made the sacrifice of the year worth it. 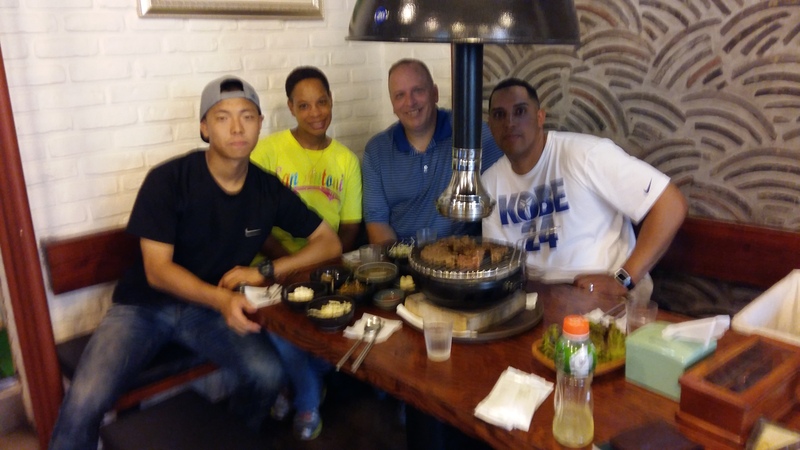 Through my Army assignment to the Yongsan area, I also reconnected with chaplain friends from previous assignments and attendance at the Chaplain School. 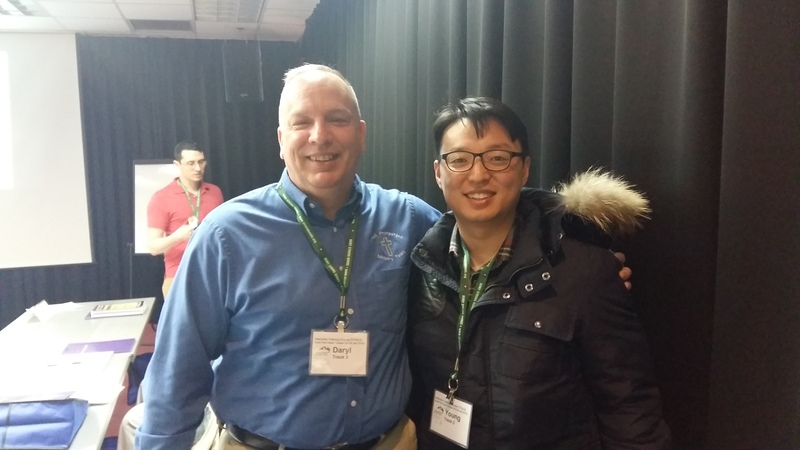 In C4, I met Young Ho Kim, who is a chaplain in the ROK Army. It was nice to run into him again at a joint training event we both attended. Sean was another chaplain I got to know at C4, who along with his wife were very kind to me while in Korea without family, inviting me out and checking in on me. Then there are the other chaplains who I met here and got to know a bit as we worked together to provide religious support to the USAG Yongsan: Chaplain Kim, Mark Lee and Brian Oh of USAG Yongsan Religious Support Office; Yun Kim who was pastoring the Traditional Protestant Service when I arrived, who I took over from; Jorge Budez who pastored the Episcopal service where I attended many times (and even preached once) and who also covered for me; Jamison Bowman who was on rotation in Korea; Chaplains Wheatley and Morris in the 8th Army Command Chaplains Office; and finally Martin Cho who I was in the same CHOBC with and now he has come to replace me as Brigade Chaplain; all just to name a few. I look forward to running into these chaplains again as we continue to serve. 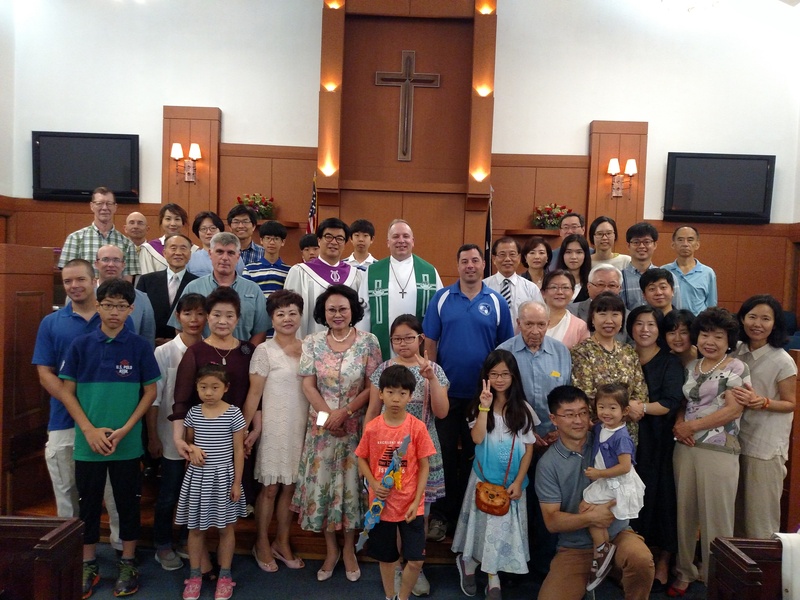 My additional assignment as pastor of the USAG Yongsan Traditional Protestant Congregation was a rewarding experience. I didn’t think after just a year in the congregation that I would grow so attached, but they are great people who became great friends and our times of worship and fellowship were very meaningful. I will not soon forget the blessings that I received through this congregation! John and me by the Lake. There was so much more that I experienced in Korea that multiplied the blessings of the last 377 days. I met John Eun Yup Kim online before arriving in Korea and soon connected with him and and his family who provided a warm welcome and great introduction to Korea. 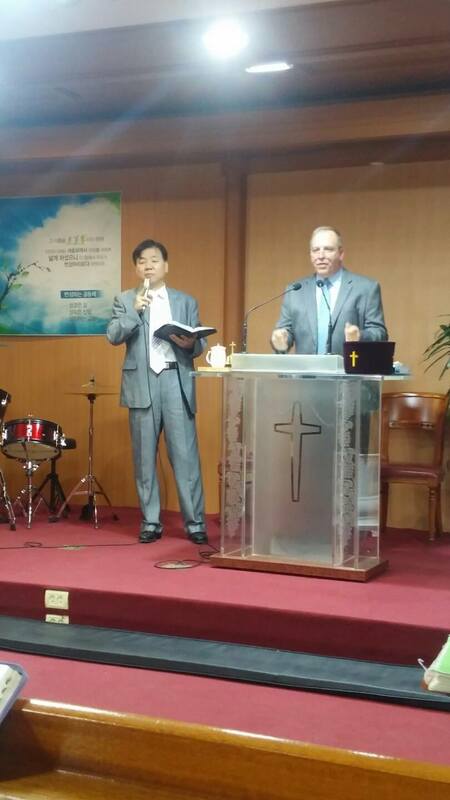 John helped me attend the Korea National District Assembly and later invited me to preach at his church. 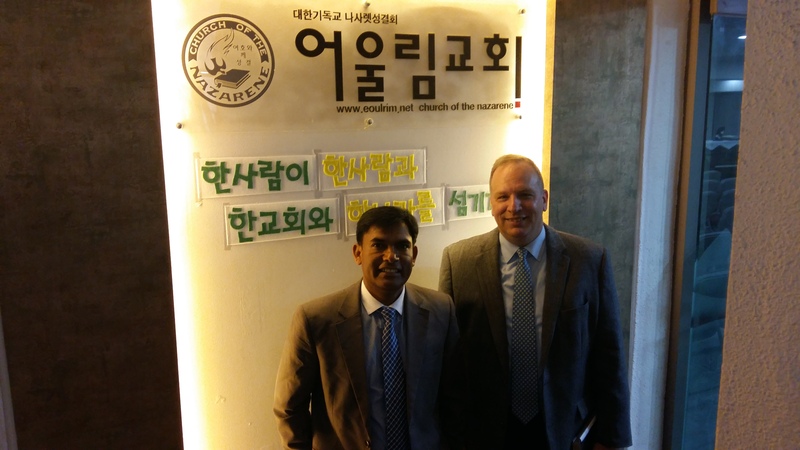 I met Bashir Asim Gil, from Pakistan, at the District Assembly, and we got together several more times (including in his home with his wonderful family), culminating in my visiting the church where he ministers my last Sunday in Korea and getting to preach at the English Service. Both John and Bashir have become good friends who I hope to keep in touch with for years to come and hopefully see them at Nazarene gatherings somewhere in the world! As I was preparing to come to Korea, I thought that due to its proximity to other Asian nations, that I would get to visit countries like China and Japan, not to mention many areas of South Korea, but it turned out that I didn’t do much traveling besides my many trips to Suwon with my Soldiers and a “Staff Ride” to the DMZ. 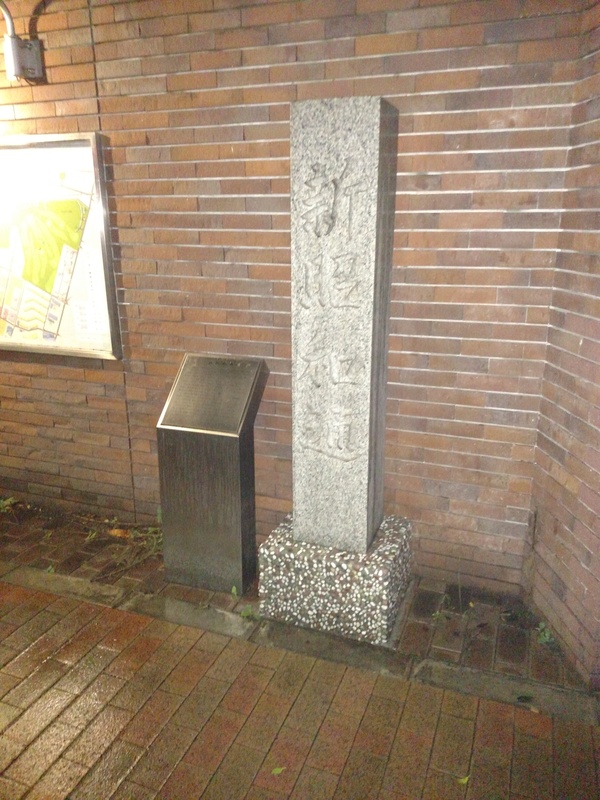 I didn’t even visit some of the interesting sites in the Seoul area that most tourists make sure to see. This is kind of disappointing, but as I look back over my posts on this blog and see the many things that I did do, I’m satisfied that my year here was anything but wasted and I have many experiences and friendships to show for my time. 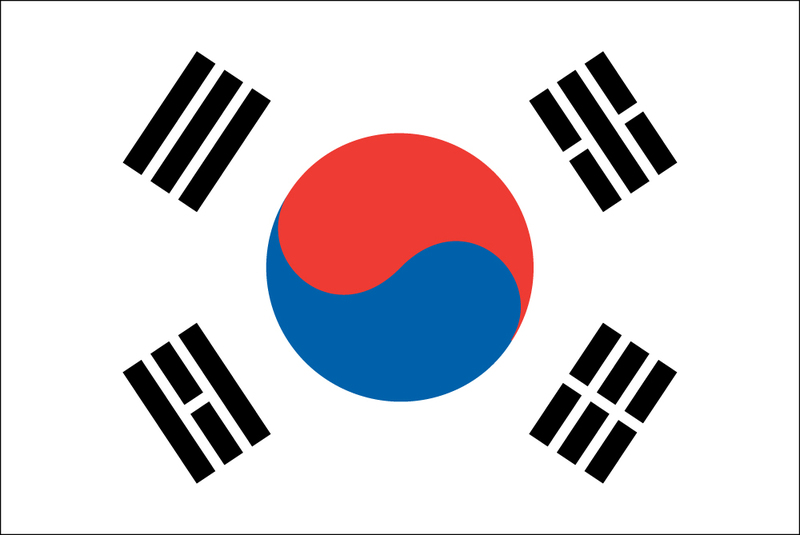 While I have really enjoyed my time in Korea, I really miss my family and home so am anxious to get back to them. But I take back with me many great memories of the people I’ve met and the places I’ve visited. 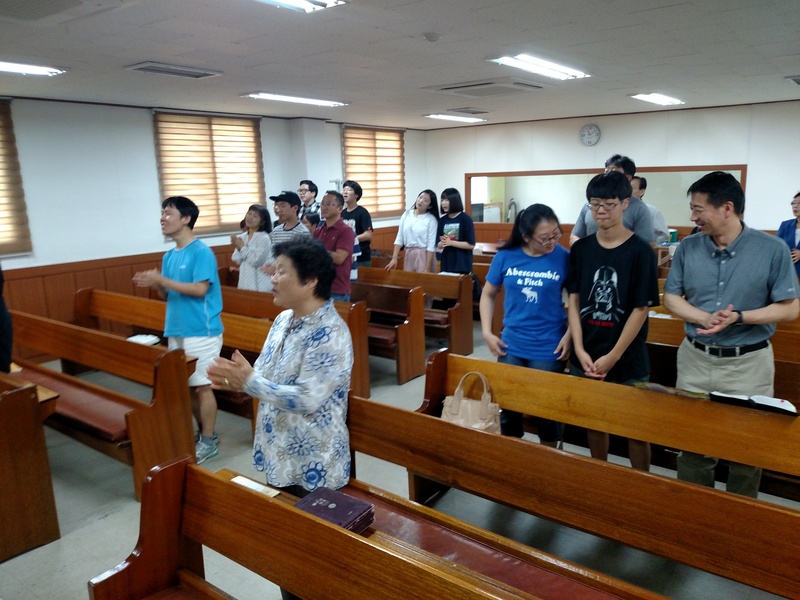 I continue to be blessed when I think of the times I’ve been able to worship with Korean Nazarenes and the military congregations on post. I return to the Untied States with a better appreciation of the work of the military in this part of the world and the challenges faced by ministers and churches seeking to reach people in this country. I will cherish the memories and and friendships that have been made and continue to thank God for the blessings they have brought. So to everyone who has been such a blessing to me this year: thank you, thank you, thank you! I pray that God will return to you many times the blessing you have been to me! 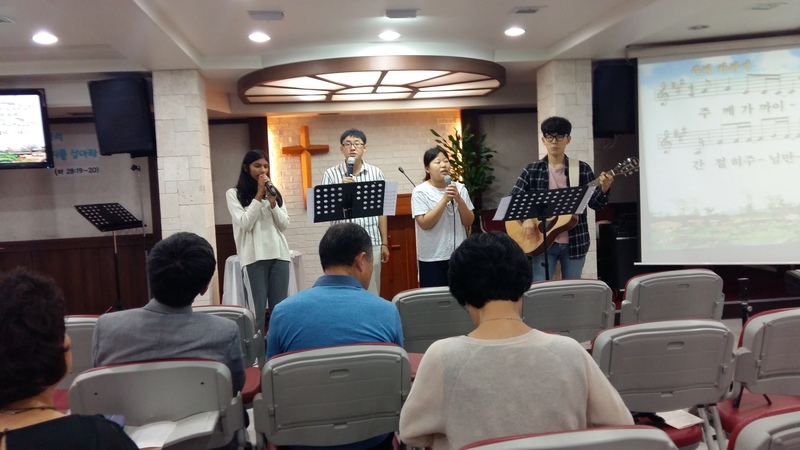 I was excited to get to worship today at another Church of the Nazarene in Korea before returning to the United States. 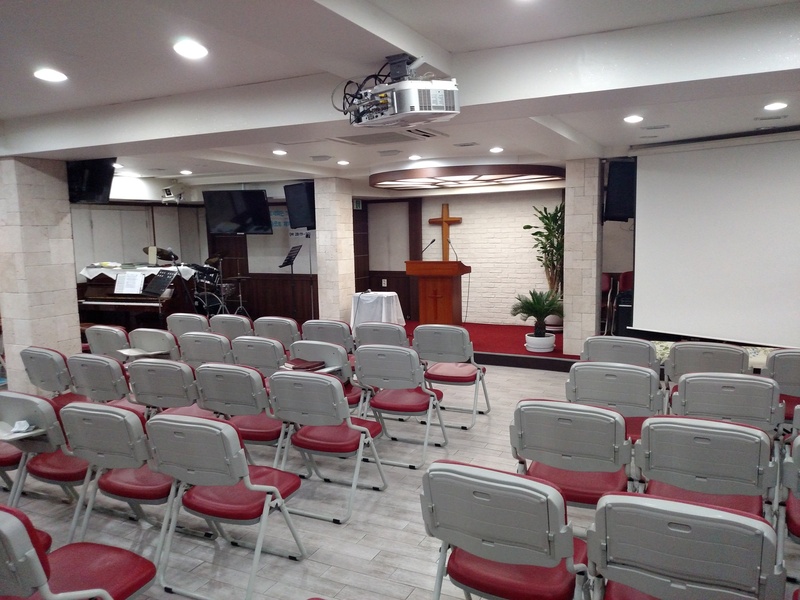 Today, my last Sunday on the Peninsula, I attended Eoulrim Church of the Nazarene in Seoul. 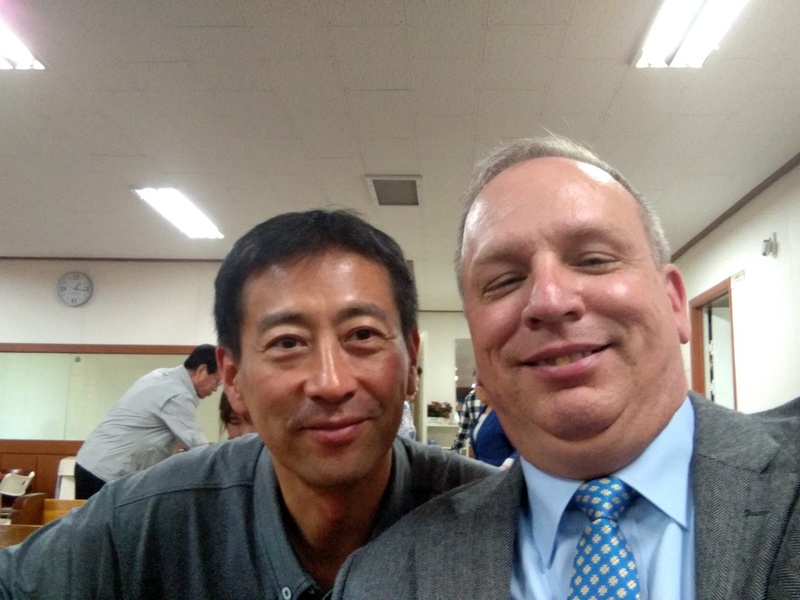 When I attended the Korea National District Church of the Nazarene district assembly back in March, I met the pastor, Tak Kyung Sung, who told me then he would like to have me come and speak at his church. However, my duties as pastor of the Traditional Protestant Congregation on post kept me from being able to do much else on Sundays, so I haven’t been able to attend but I kept in touch with Bashir, one of the pastors at the Eoulrim church. Bashir and I have been able to get together a few times since the district assembly. 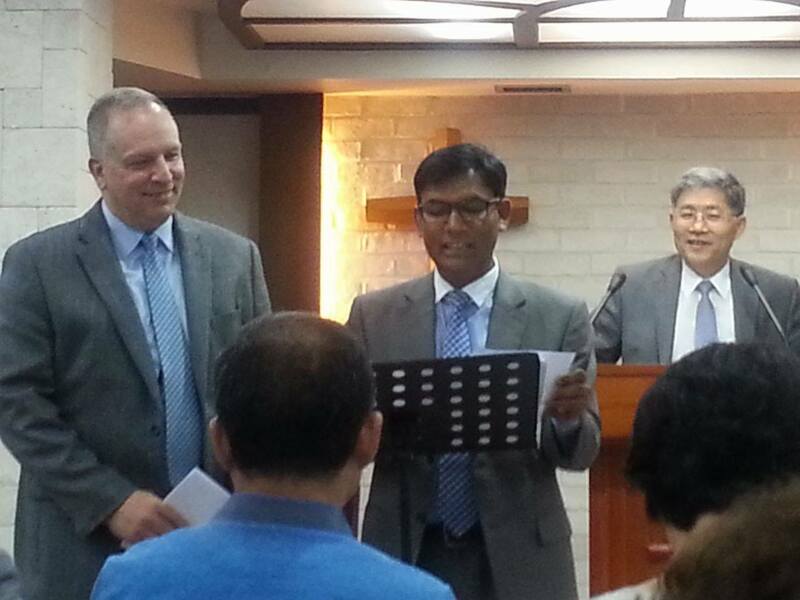 Through Bashir, I was finally able to attend worship at Eoulrim Church of the Nazarene, on my last Sunday in Korea. The sanctuary is on the lower level of the building. 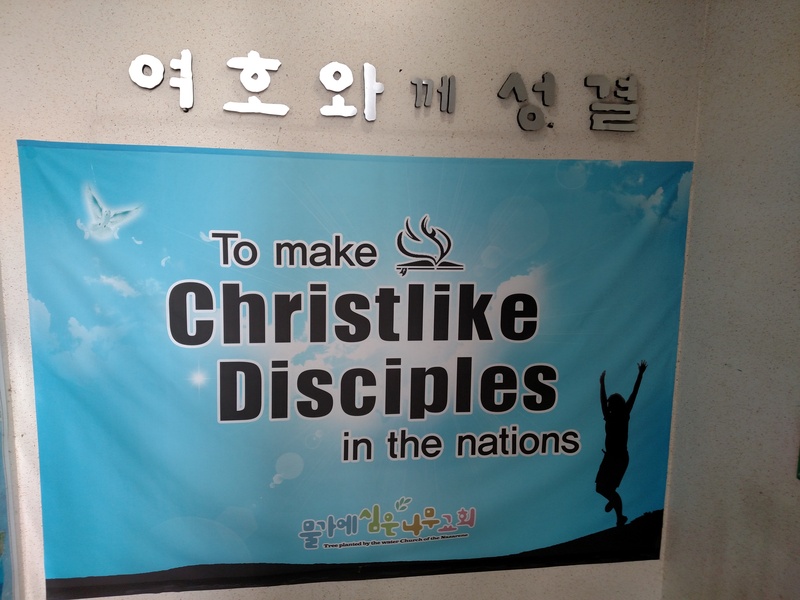 I really enjoyed being in this service, even though it was in Korean. 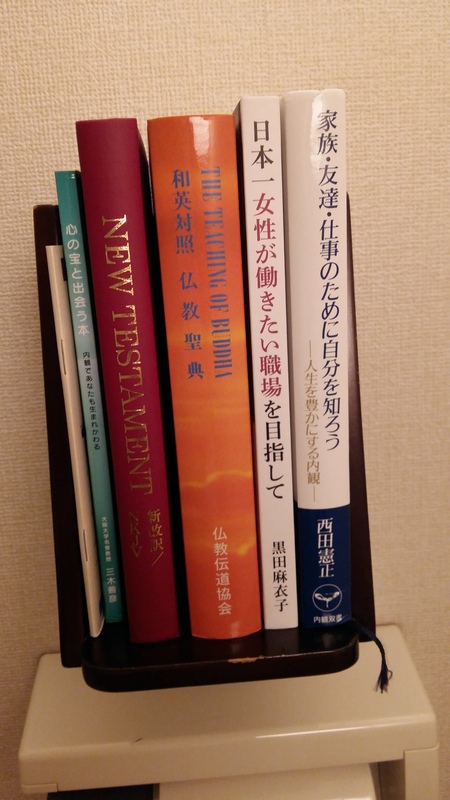 As I have commented in previous posts, the language spoken is often not as relevant as the presence of the Holy Spirit and the feeling of being among family in the Church of the Nazarene. I also experienced this when I attended Tree Planted by the Water Church of the Nazarene. It is a wonderful feeling to be able to feel “at home” wherever in the world God takes you! One of the songs we sung in this service spoke of God being present in the service. I was moved to tears when Bashir told me the lyrics, having just written about the significance about God’s presence in services where I don’t know the language the night before! The pastor spoke with what felt very much like God’s empowerment. While I couldn’t understand what he said, I certainly felt God’s presence during his message. Bashir skimmed the wave tops with his translation (sitting beside me) so I got enough to understand his urging his people to work with God in His movement and leadership and expect God to do great things. 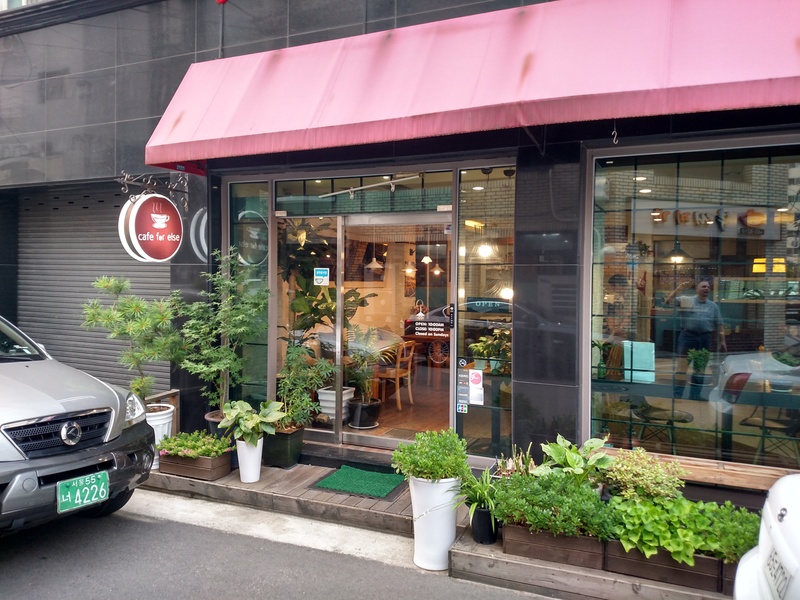 Following the first service, the congregation went up to their coffee shop for lunch together. I ate with the pastor, Bashir and another visiting minister in the pastor’s study (off of the cafe), and enjoyed the conversation. The lunch was a traditional Korean meal with rice, beef (I think Bulgogi), kimchi, noodles and some green stuff (sorry, not sure what it was). 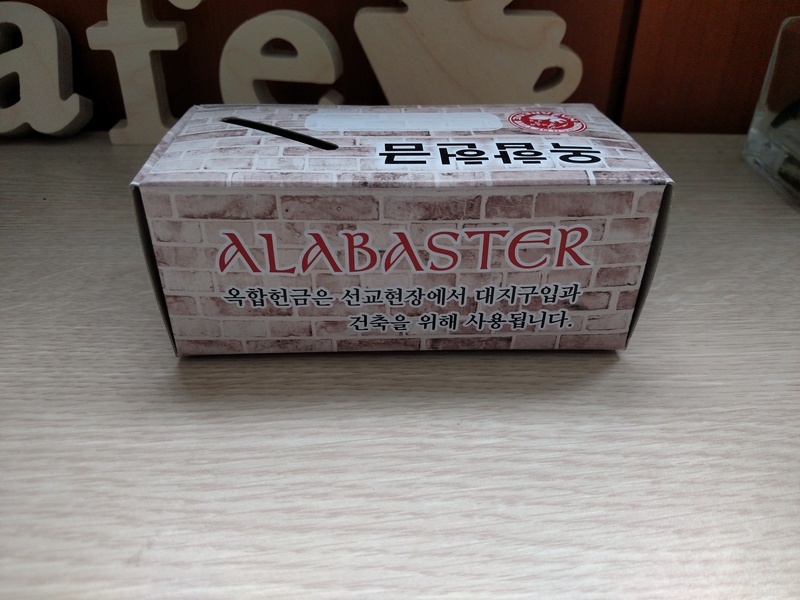 I ate some of it, but even after a year in Korea I haven’t been able to acquire a taste for all of it. The visiting minister and I had an especially long (and meaningful) conversation as Bashir and the pastor were active with doing “pastoral” things. He had studied and taught in the U.S. in the D.C. area and had significant insight into American-Asian cultures and interaction as well as the mission of God. 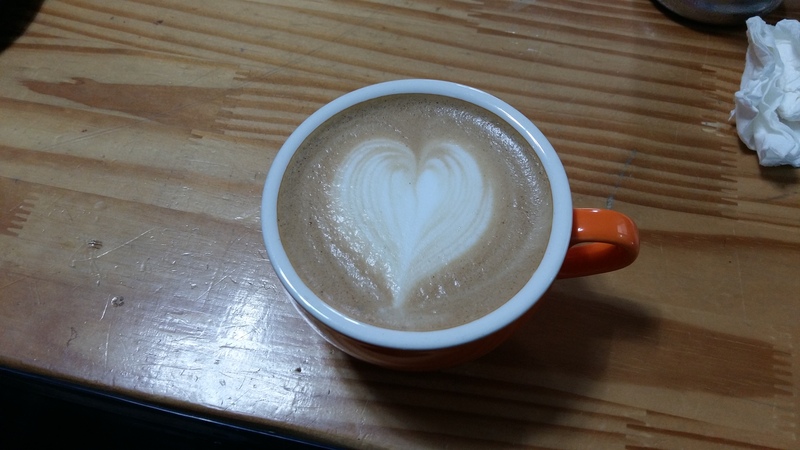 Of course we had to have a cup of coffee after eating lunch! 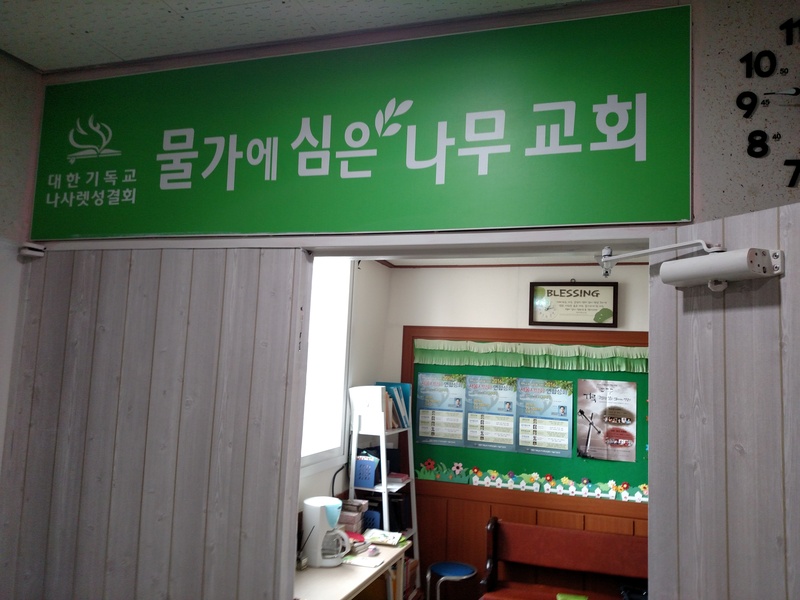 After lunch we went to the next service at 1400, which was also in Korean. 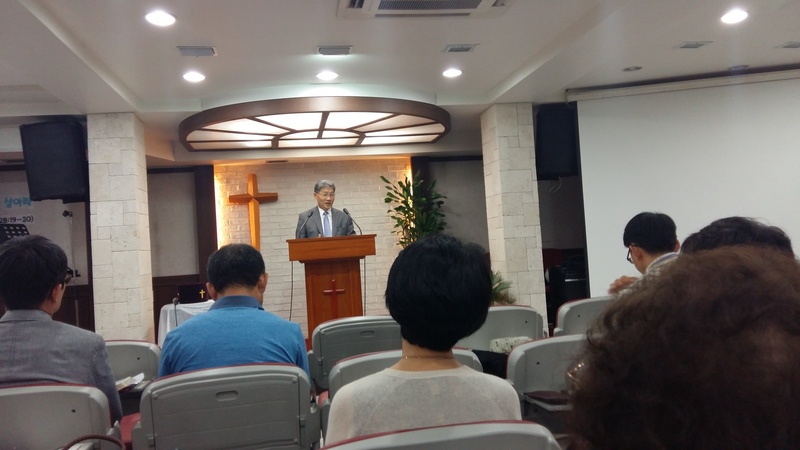 At this service, in addition to more good music, the visiting minister who had studied and taught for many years in the U.S. spoke to the congregation from Acts 1:8. For being a Southern Baptist, he had quite a bit to say about the work of the Holy Spirit, from what I got from Bashir’s wave-top translation and the little bit of English the preacher used (I think for my benefit)! Next was the English service at 1530. At this service I had the privilege to preach. 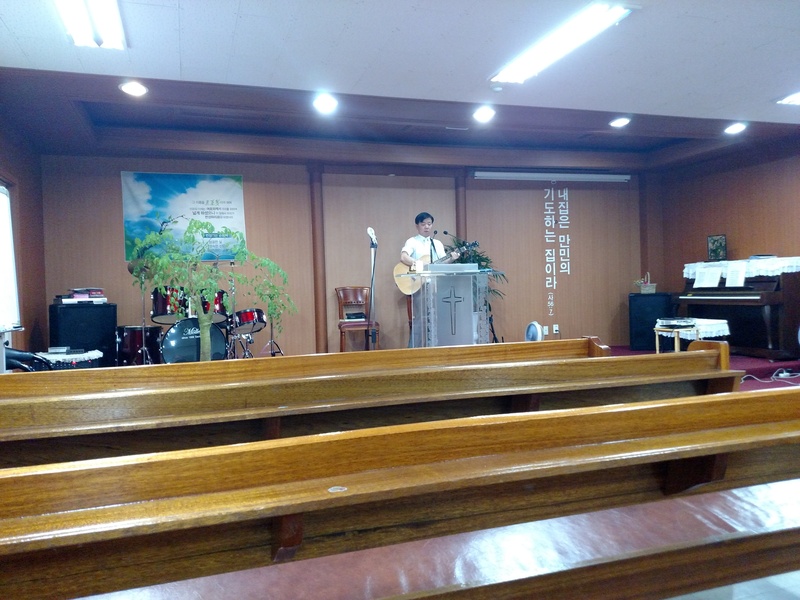 Even though it was an English service, many of those in attendance are still learning English, so some (most) of my sermon was translated into Korean by my friend Bashir. I think this may have been more difficult than translating straight from English to Korean as there was more discussion about the best words to use both in Korean and English. Because of the way the translating was being discussed, it was much more “conversational” but occasionally I would get going without pausing for translation which caused Bashir to have to re-preach that portion of the message. 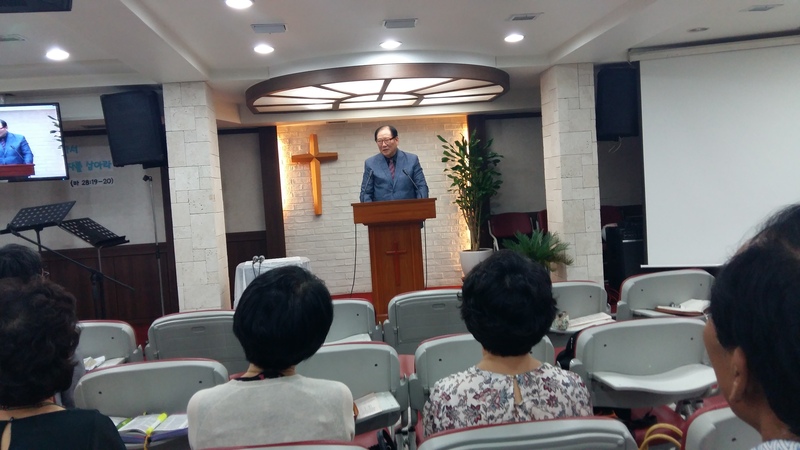 Many times it felt like we were team-preaching which seemed to be very effective since I’m not familiar with Korean language or culture. It turned out to be a very fun time. 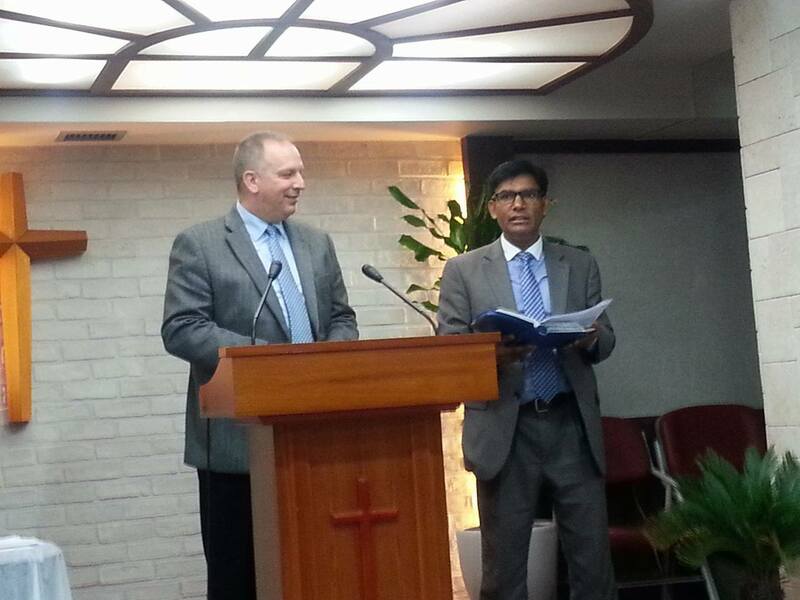 This was another great experience for me (as are most times when I am able to preach). I always get excited at the “international-ness” of the Church of the Nazarene when I have the opportunity to minister among them in other countries. Bashir and Pastor Tak presented me with gifts for being their guest. It was almost like Christmas! 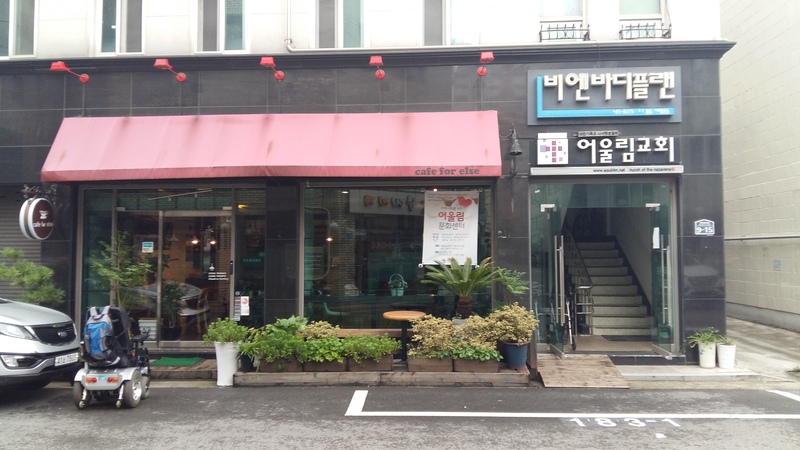 Cafe for Else, run by the Eoulrim Church, on the 1st floor of the building where the church worships. 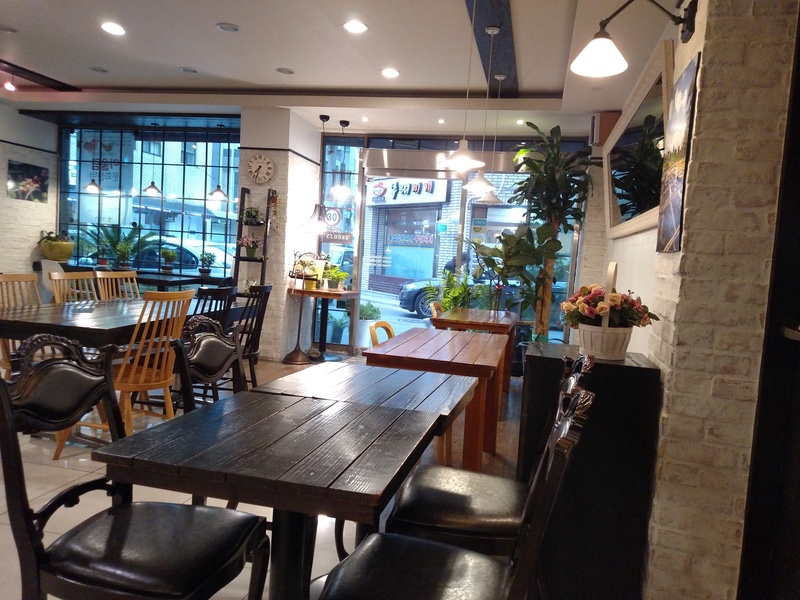 Inside of Cafe for Else where they also share a meal together after the worship service. I really, really enjoyed my time at Eoulrim Church of the Nazarene, as I did with Tree Planted by the Water Church of the Nazarene a couple weeks ago. 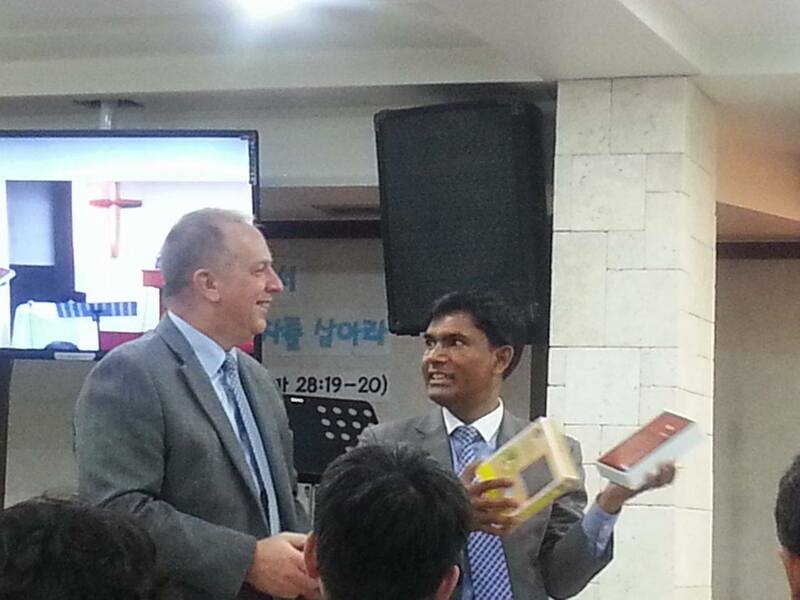 I appreciate the interaction I have had with Nazarenes in Korea and the friends I have made during my time here! 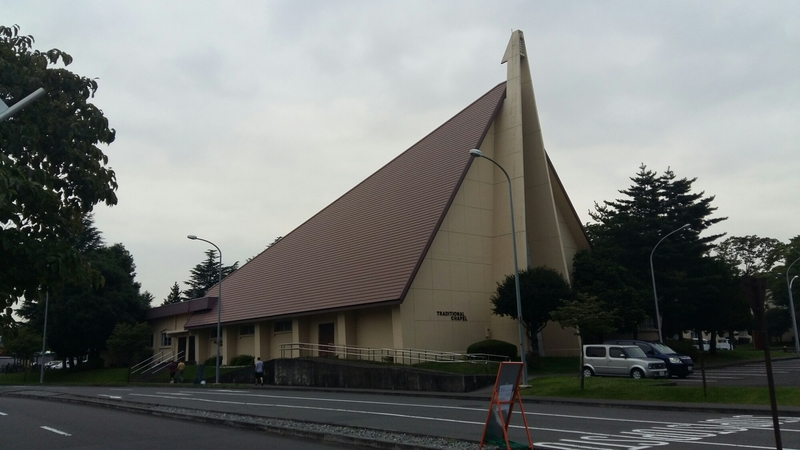 The church is on the 3rd floor of this building. 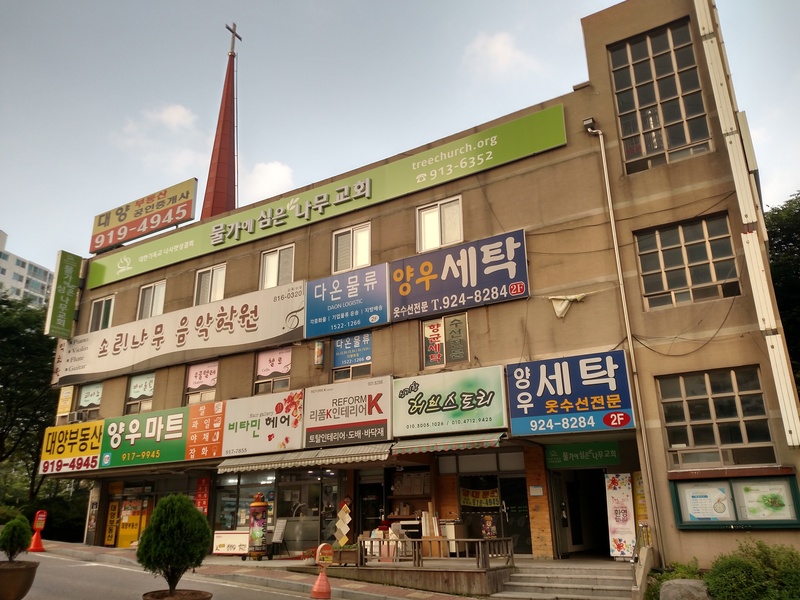 With me no longer having the responsibility of a congregation on post, I was finally able to attend a local Korean Church of the Nazarene, in fact, I had the opportunity to preach. 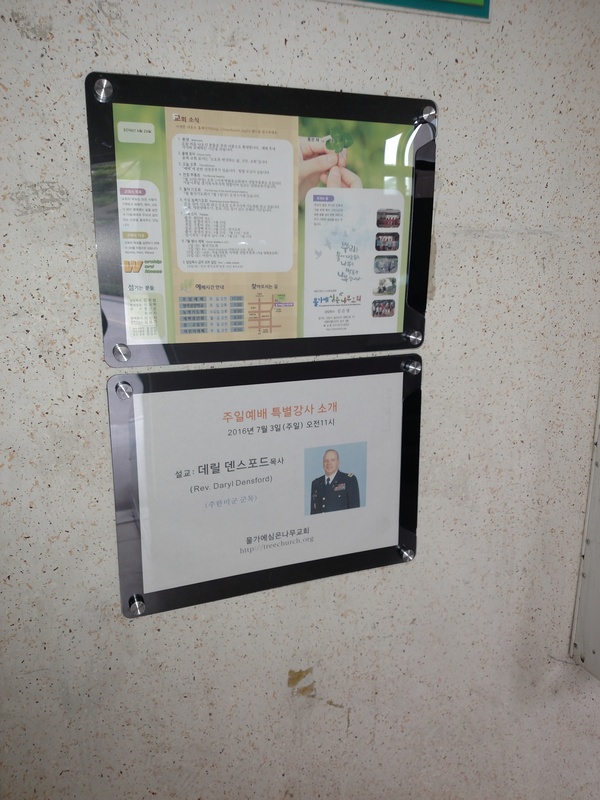 “Tree Planted by the Water” Church of the Nazarene is a bit north of Seoul and is pastored by John Eun Yup Kim. I first met Pastor Kim on Facebook before I moved to Korea when we were commenting on the same post. 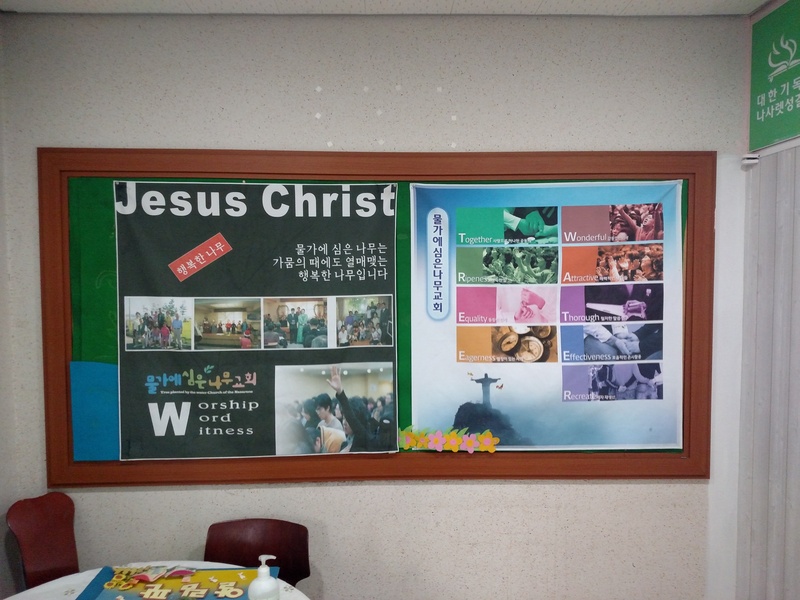 Since coming to Korea, he has been very helpful in connecting me to the Church of the Nazarene in Korea and has become a good friend. I was honored and excited when he invited me to preach at his church. The third floor entry into the sanctuary. Tree Planted by the Water Church of the Nazarene has just been in their current location for a few month. 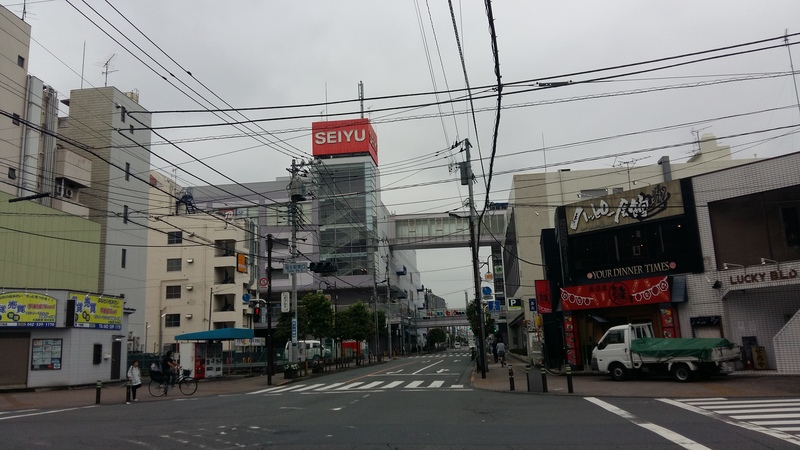 They own the third floor and roof of a three-story building which has businesses and stores on the 1st and 2nd floors. This building configuration seems odd to someone from the United States, but is quite common here since space is at a premium. The church uses the roof for children’s activities and picnic cook outs. When the weather is nice, it’s a great space. The third floor has the sanctuary, two rooms to the side (could be classrooms) and a small room which glass in the back of the sanctuary. There is an entry way with literature and book racks, bulletin boards and other information. There were enough things posted and on the racks that were familiar as being Nazarene, that I felt “in the right place.” The welcome that I received from the church people made me feel very much at home. 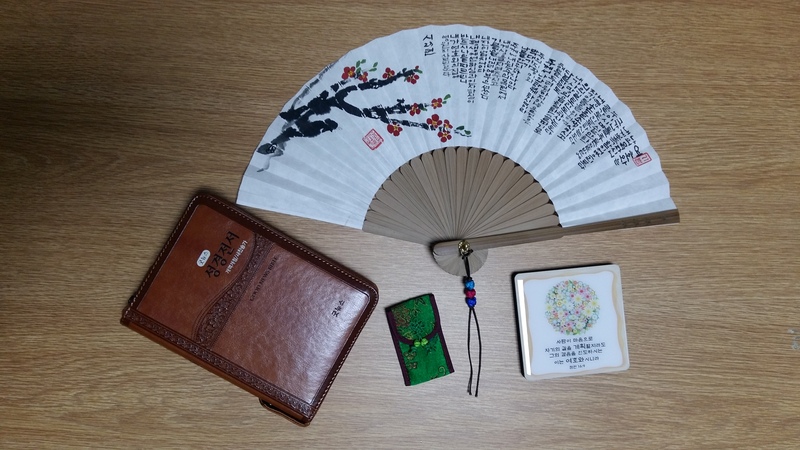 The order of worship was common, though in Korean, and the movement of worship was familiar. While I couldn’t understand what was being said, I sensed God’s presence and experienced the joy of the congregation in being in God’s house to worship him. Pastor Kim did well in taking my text and sermon and tying in the music to form a theme. 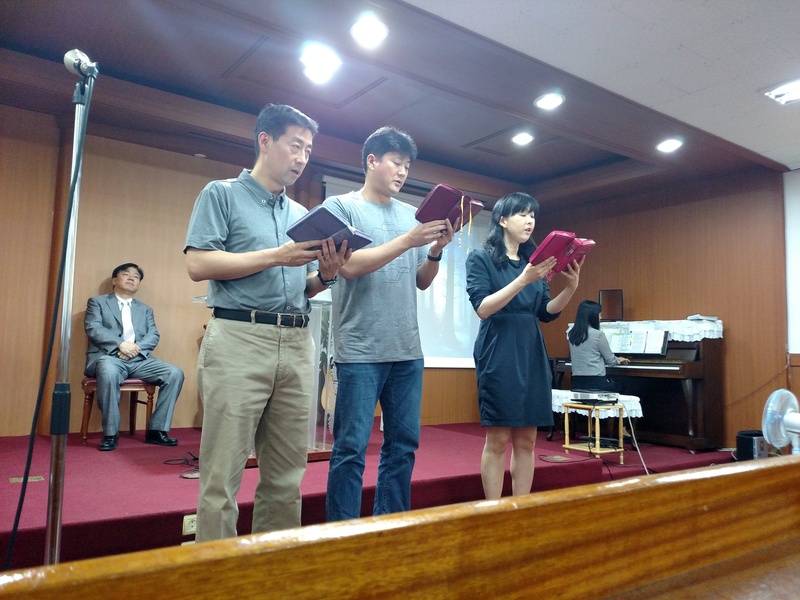 There was wonderful participation from the congregation throughout the service, including the special music sung by Pastor Kim’s wife and her two brothers. I was blessed by the song they sang realizing that it can be “well with my soul” wherever in the world I go because wherever I go, God is there. I’ve only preached with a translator one other time, when I was in Argentina on a Work and Witness trip, so I had forgotten how difficult it is. Having to break after every paragraph makes it difficult to maintain momentum and keep flowing. It’s times like these when you really have to rely on the Holy Spirit to do his part. I prayed for an Acts 2 kind of experience, not that there would be a miracle of languages necessarily, but that the Holy Spirit would help the congregation hear what God wanted them to hear. Since that doesn’t rely as much on me, I can trust that God will come through every time! I decided to preach on the Temptation of Jesus found in Matthew 4:1-11. Had I felt God’s leading in a different direction, I certainly would have gone that way, but wanted to use this message for a number of reasons: 1) I believe that as we consider Jesus’ temptation, we can learn how to resist temptation when it comes our way. 2) I had preached from my outline on this passage 14 other times over the last 14 years, so it’s familiar enough that I could put my best foot forward as a guest preacher. 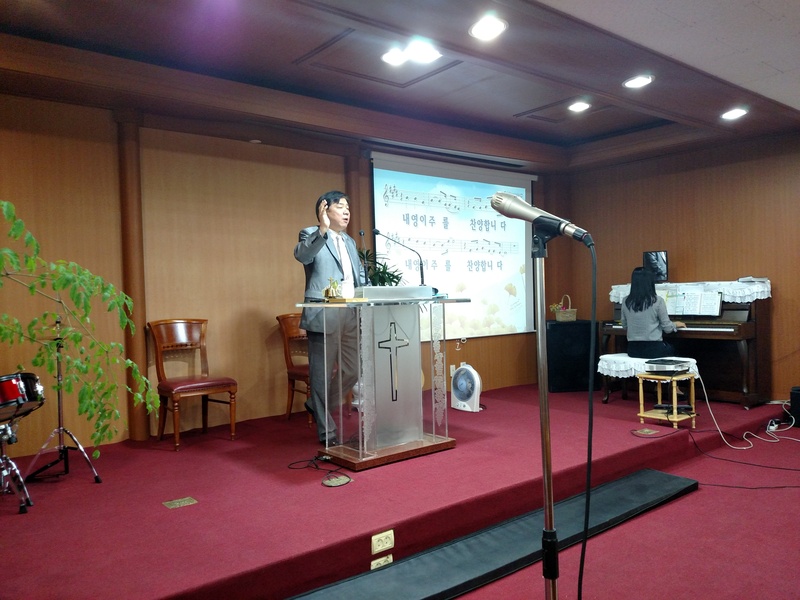 3) There is some excitement for me preaching this message in Korea, since I have preached it in other countries and several states in the U.S. It seemed to be received well, at least the congregation was very kind to me! Another couple minutes of my sermon, talking about being safe in the center of God’s will. After the service, the congregation always eats a meal together. Usually one of the family prepares it for everyone. 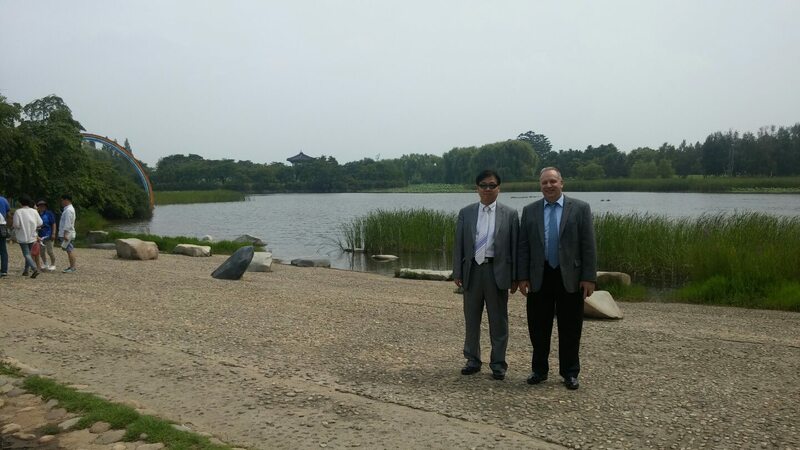 Today, it was provided by the pastor’s wife’s brother who was visiting from China where he’s the Korean ambassador. 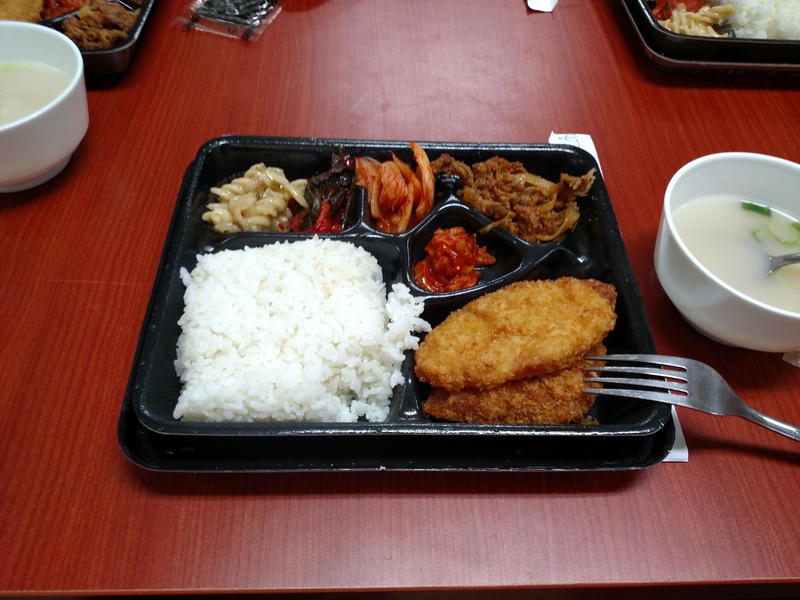 It was a good meal, though I’ve found that some Korean food just doesn’t work for me and some of it was too spicy for me, though everyone else was eating it fine, with nothing to drink. 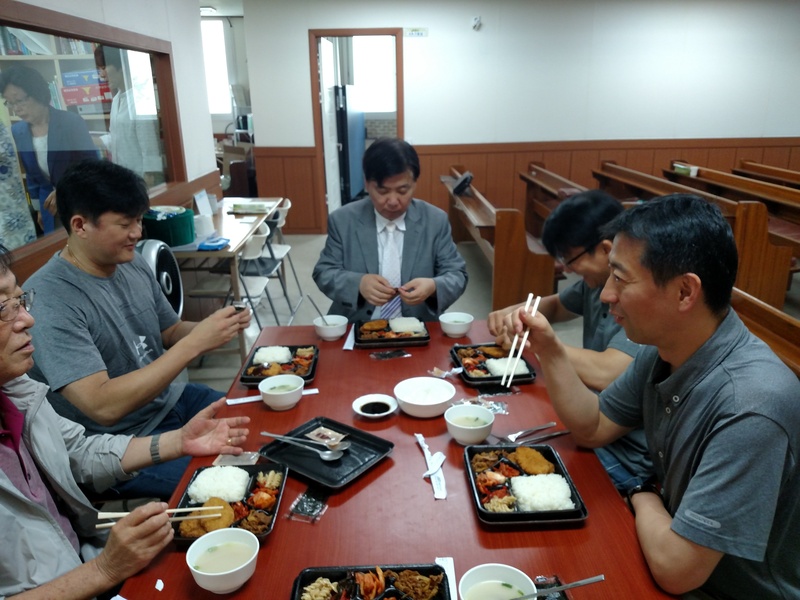 Pastor Kim arranged it so that those who could speak English sat at the table with me, so we could enjoy conversation. The others sat at another table- one where they sat on the floor. so I was thankful I was at the “English” table! After the meal, we were served a few other goodies, cherry tomatoes (which they grew on their roof), a chocolate covered treat from Japan and a filled cake from Beijing; all of this along with a small cup of coffee as we talked together. Fortunately, all of the men at the table spoke English so we were able to communicate. 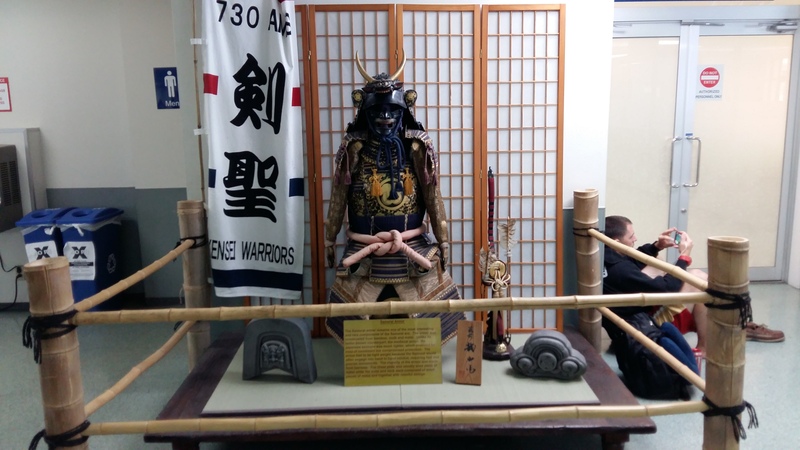 There were several questions asked, by me about them and their culture and many from them about my experience in the Army and the United States. A short time after eating, they have Bible study, since many of the members drive from a distance to attend, coming back for an “evening” service would be a lot of driving. 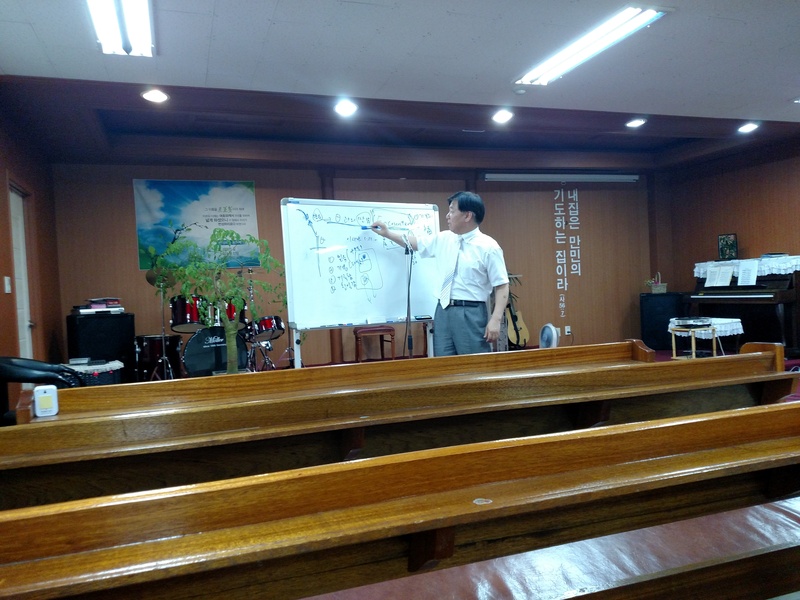 I sat in on the Bible study, though other than a couple of pictures and an English word or two that Pastor Kim put on the white board, I didn’t understand any of it. .It was a great day with family. It’s true that wherever you go in the world, you can find family in the Church of the Nazarene! I was blessed by the time I spent with the congregation of Tree Planted by the Water Church of the Nazarene and humbled & honored by their welcome. Some things are the same wherever you go! 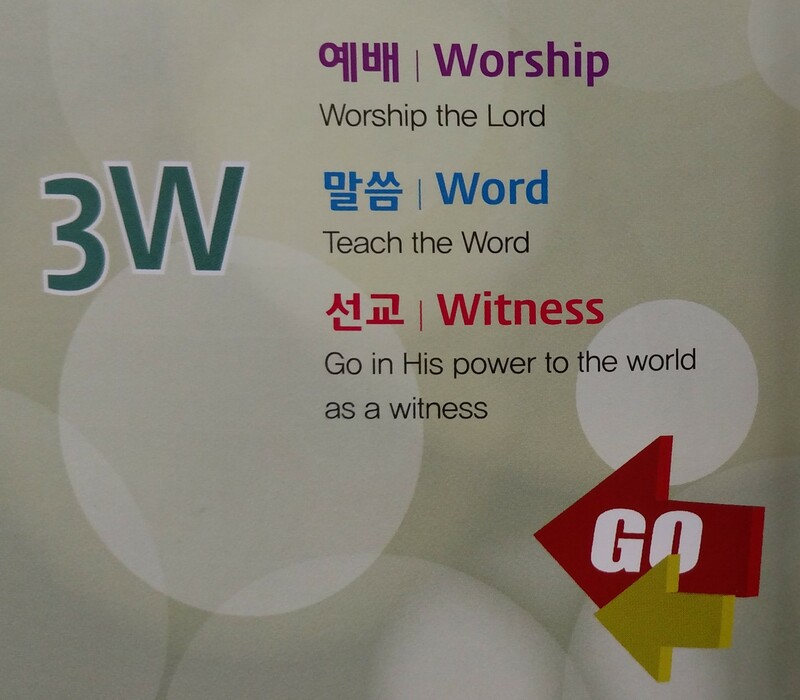 The church’s notices in the lobby on the 1st floor of the building. The one on the bottom is a notice of my being the guest speaker!